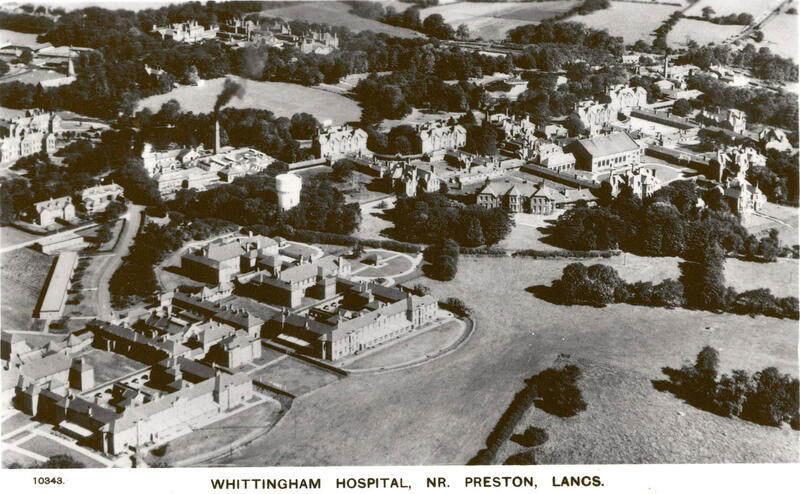 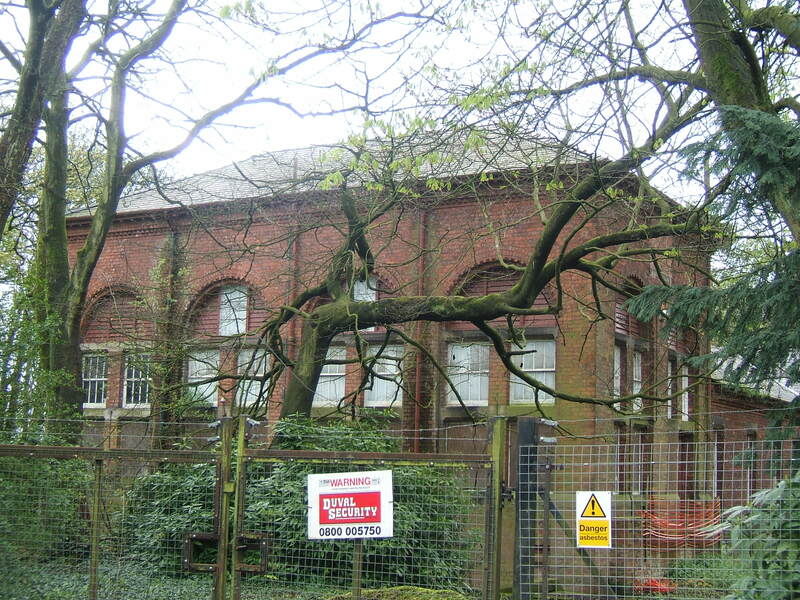 Whittingham was developed as the fourth county asylum for Lancashire, with premises at Lancaster, Prestwich and Rainhill already in existence by this time. 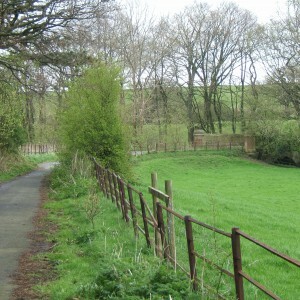 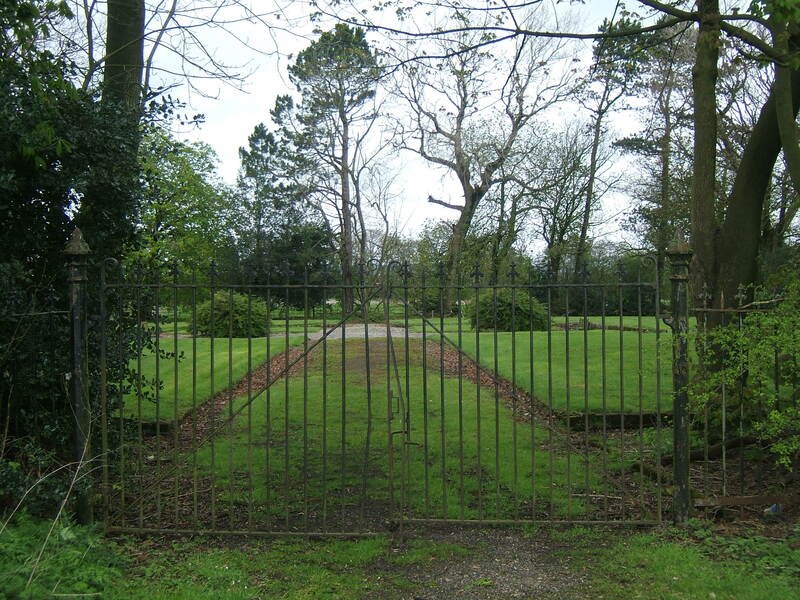 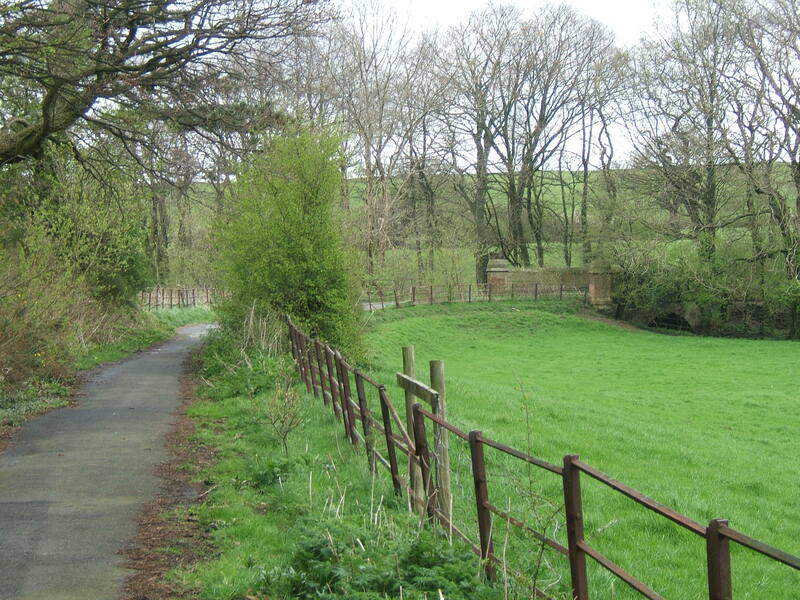 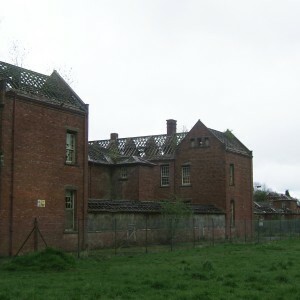 The new asylum was to be convenient for the area around Preston with a site selected between the villages of Goosnargh and Haighton, occupied by the Whittingham Hall farm and its land. 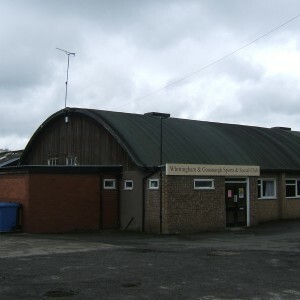 The building was designed to a novel plan unlike others previously constructed and was formed of a semi-circular corridor with pavilion like ward blocks radiating from it. 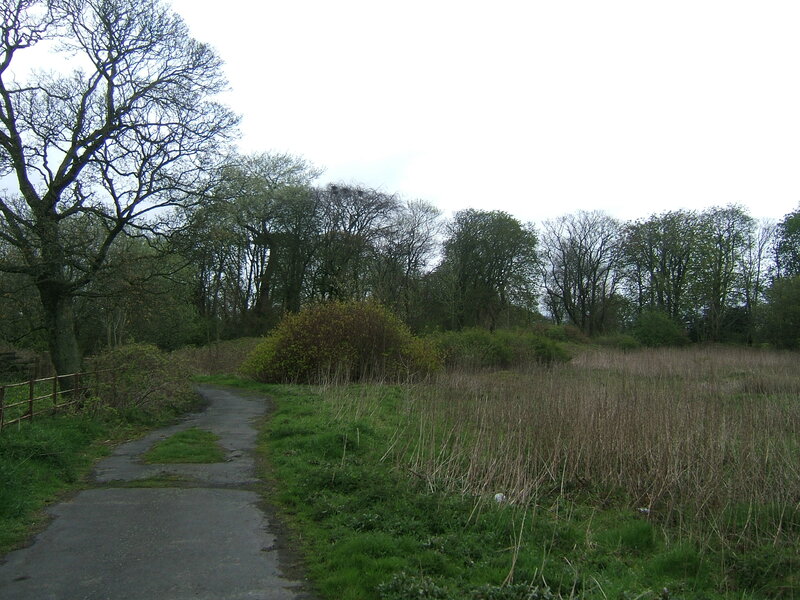 To the north further blocks were located along a linear corridor which met at each end with the semi circular one giving convenient access across the structure. 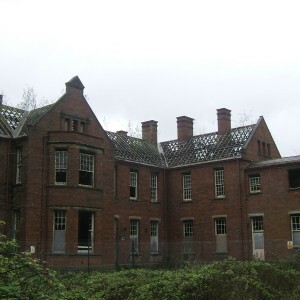 The blocks varied in numbers of floors, with three on most wards. 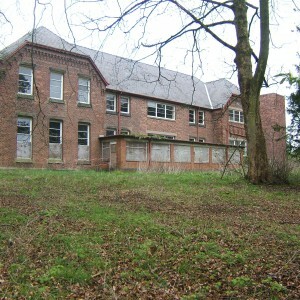 To the north the small administration block was located with stores, kitchens, and a recreation hall lying in between there and the superintendent’s residence to the south. 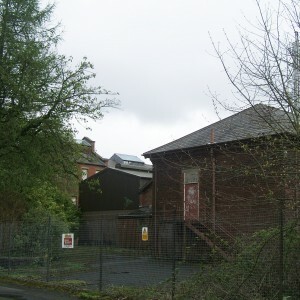 At either end of the linear corridor was placed the powerhouse and brewery complexes. 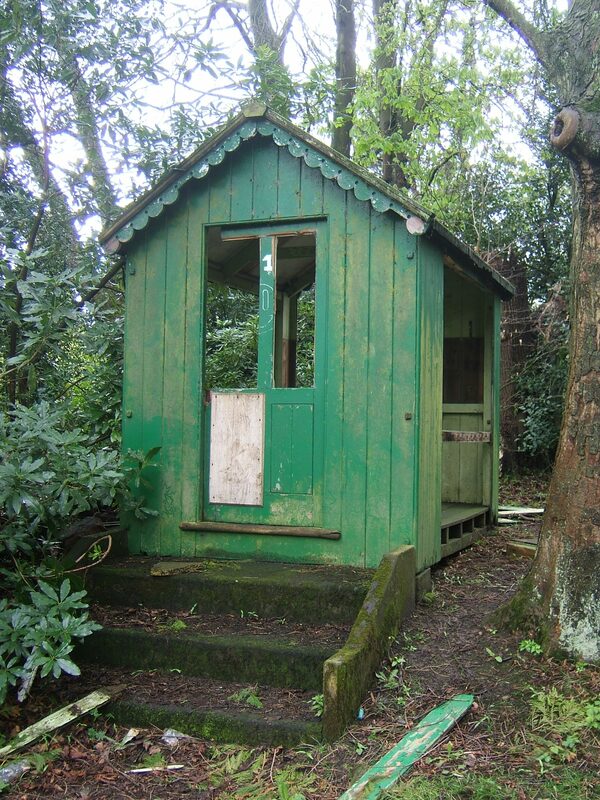 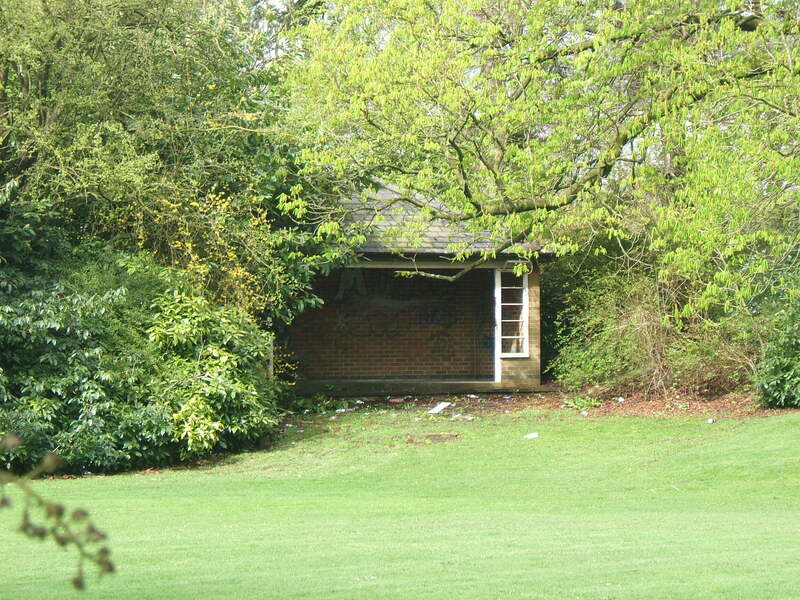 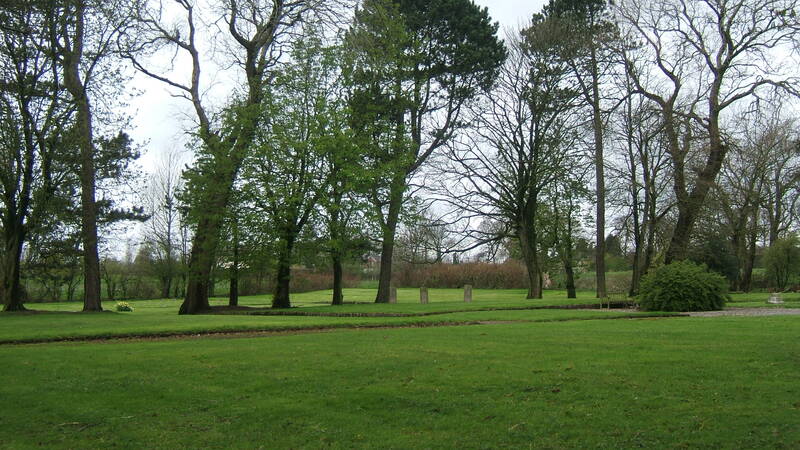 A mortuary was located in the grounds but moved at several times thereafter. 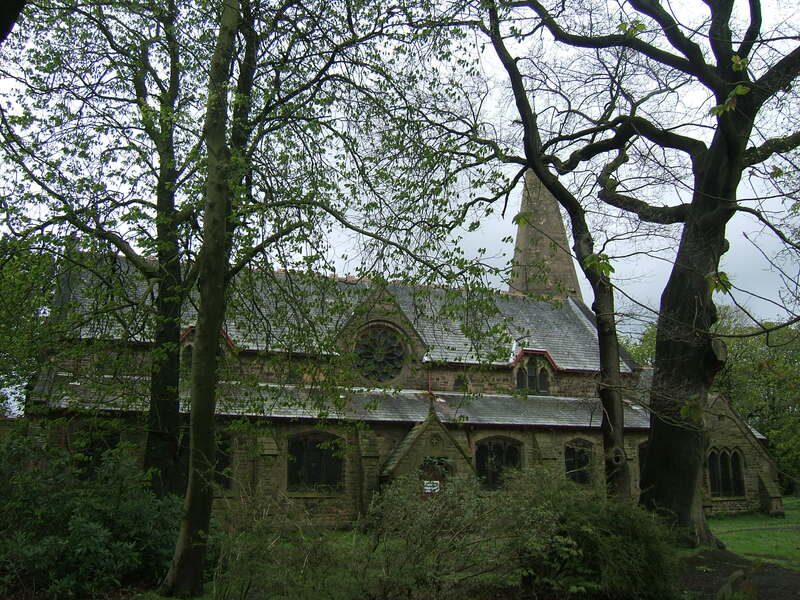 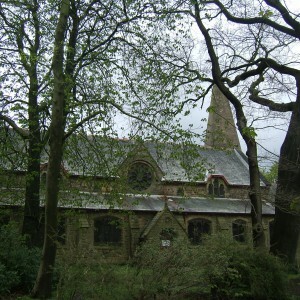 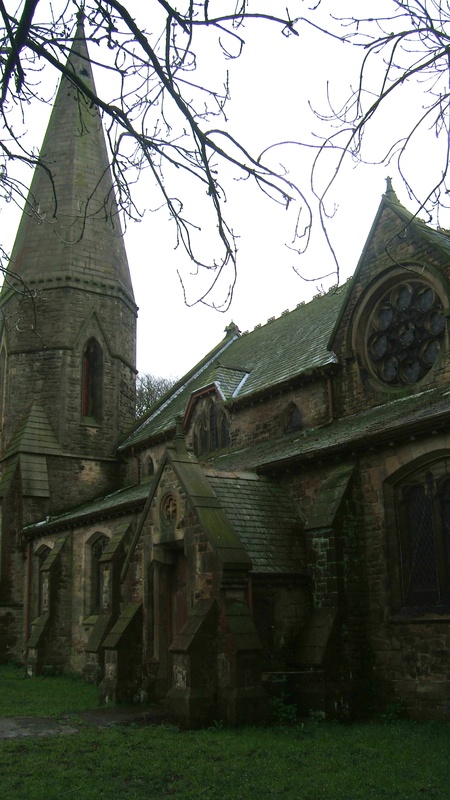 Elsewhere within the grounds a church was constructed as well as a residence for the Chaplain. 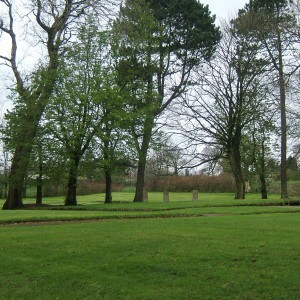 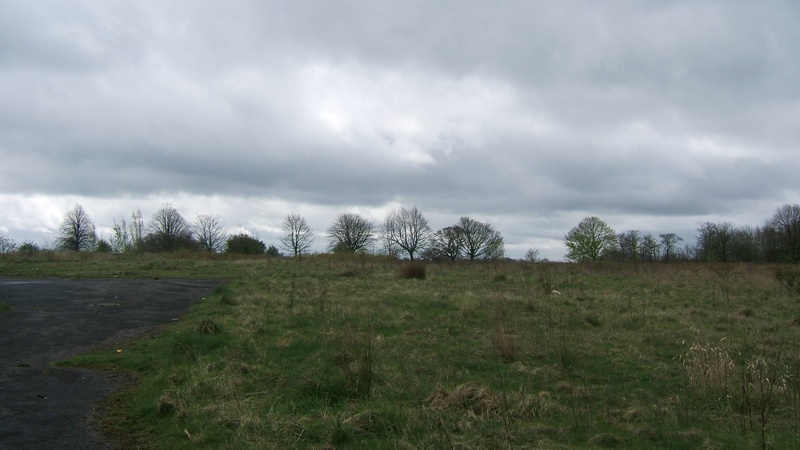 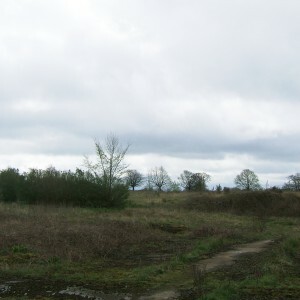 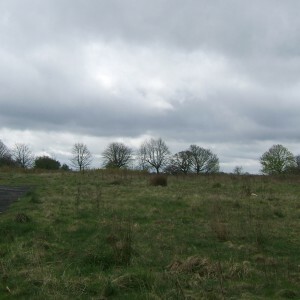 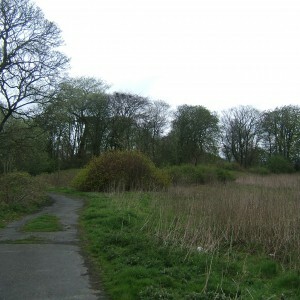 A burial ground was also subsequently located to the north of the church close to Got Field Farm for the burial of the bodies of unclaimed pauper inmates. 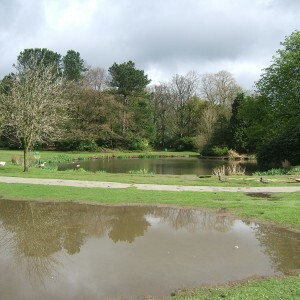 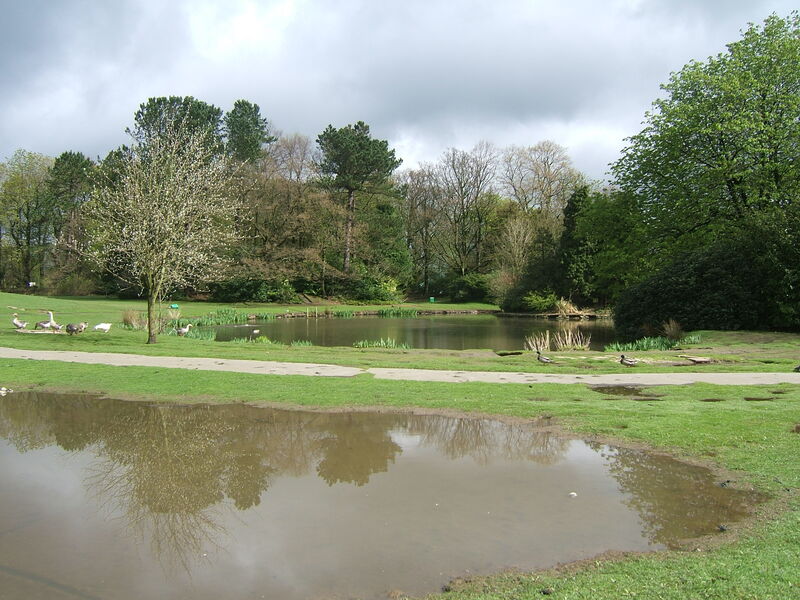 An ornamental lake known as the ‘Duck Pond’ was constructed from a hollow in the grounds, which was created from the extraction of material for the construction of the buildings. 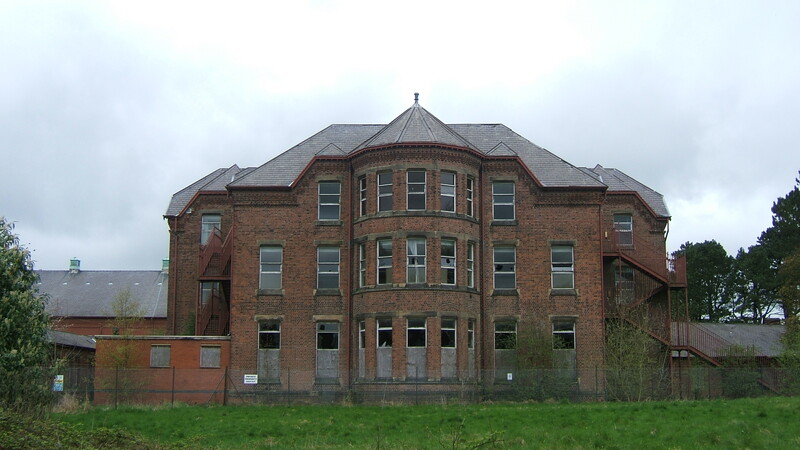 The architect for the new asylum was Mr. Henry Littler of Manchester. 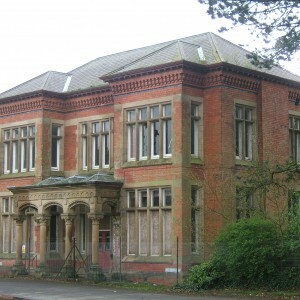 His architectural practice would subsequently be responsible for most further developments at Whittingham, the new asylum at Whalley, as well as additions to Prestwich and the original buildings at the Brockhall Inebriate Reformatory all of which formed part of the Lancashire County’s Asylum Committee or its successor the Lancashire Asylums Board. 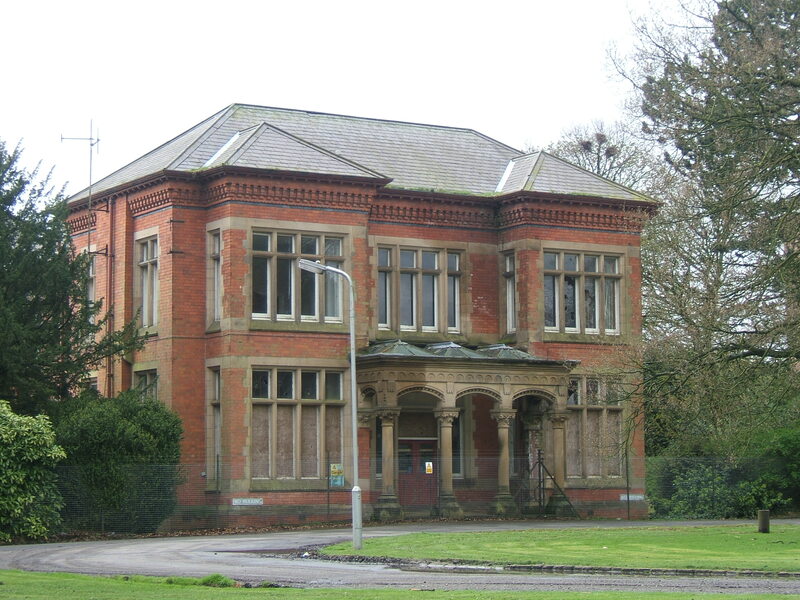 The complex was constructed from 1869 and built predominantly from red brick with slate roofing and although plainly decorated, bay windows and a decorative roofline prevented the building from appearing unduly austere. 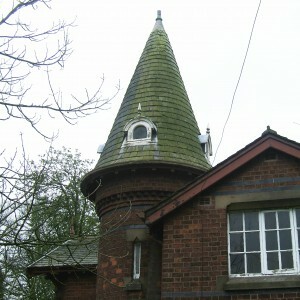 The Lodge cottage at the main gate was provided with an unusual, distinctive turret although the lodge at the Haighton Gate was less decorative. 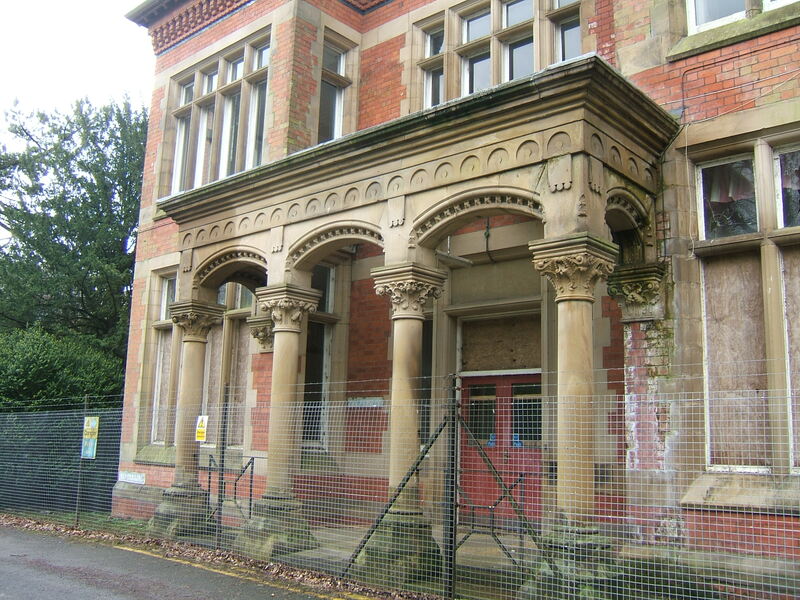 An intricately carved stone porch was provided at the administration block, which also featured mullioned windows. 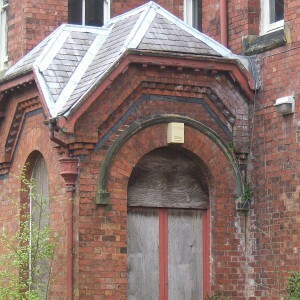 Originally this building was surmounted by an ornate clock tower, which was removed as soon as the turn of the century. 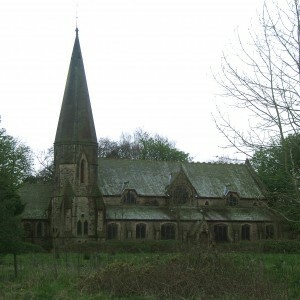 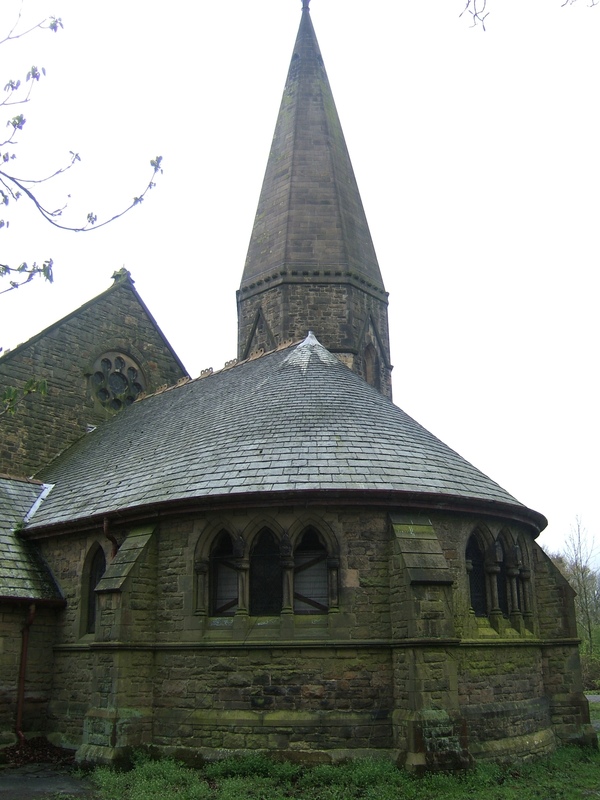 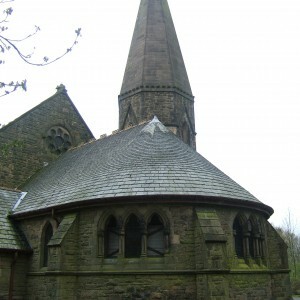 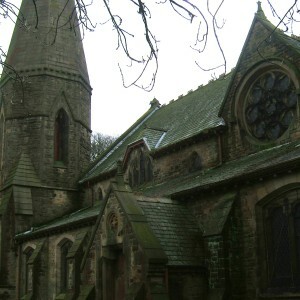 The asylum church, which was dedicated to St. John was constructed as part of the plan and was accompanied by a residence for the chaplain, The Hermitage. 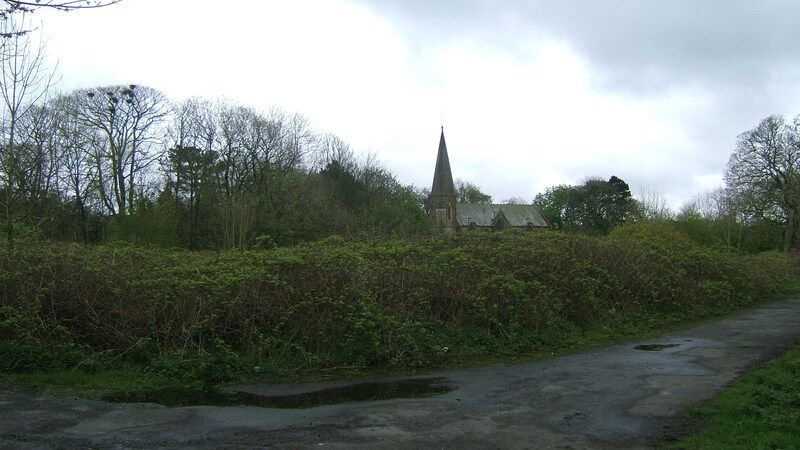 At first, inmates were buried in the local churchyard, but demand soon outstripped available space and a cemetery was consecrated to the west of Got Field Farm in 1895. 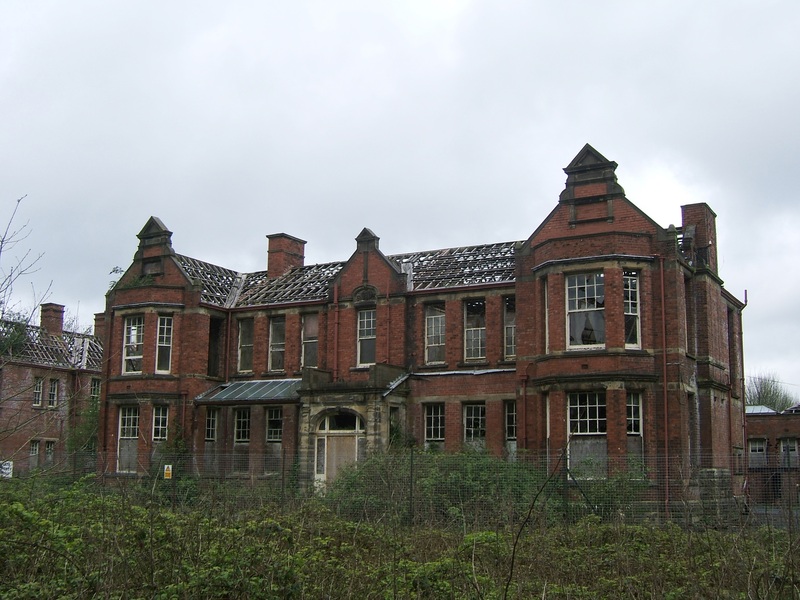 The asylum opened on 1st April 1873 and received patients transferred from other Lancashire asylums, workhouses and out of county institutions. 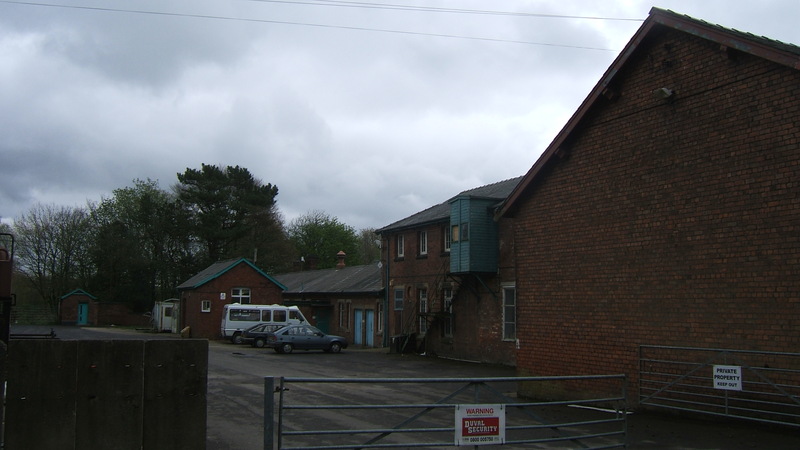 Capacity was provided for 1,000 inmates within the building. 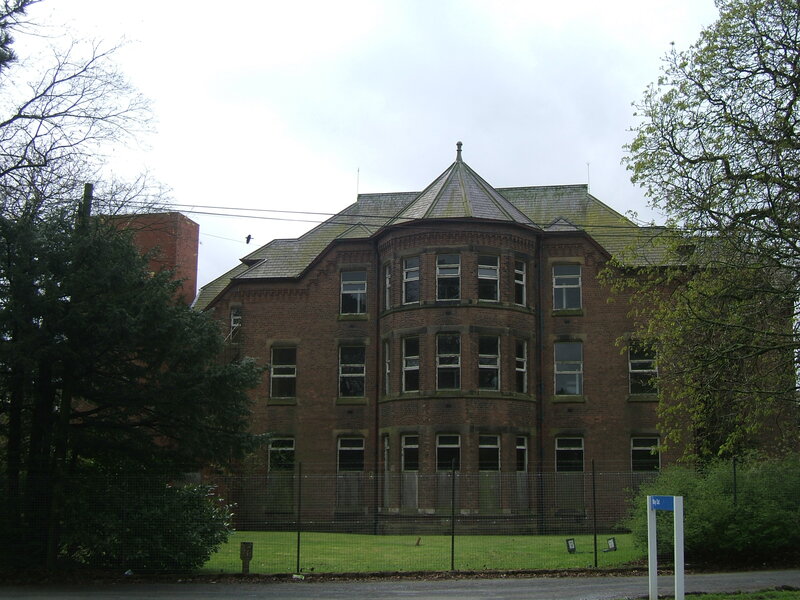 The very first inmates of the building had been sent ahead from the Prestwich asylum to set up the asylum in preparation for full occupation. 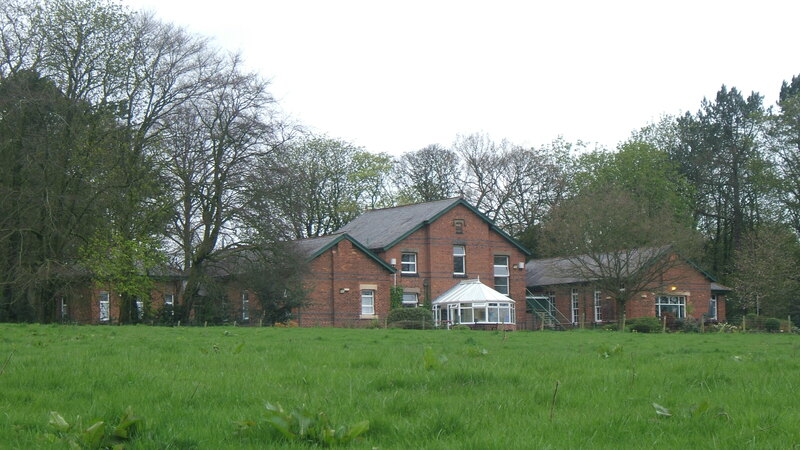 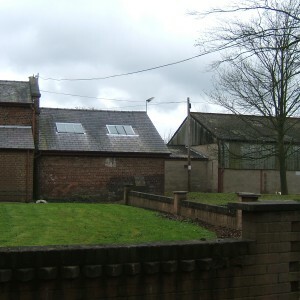 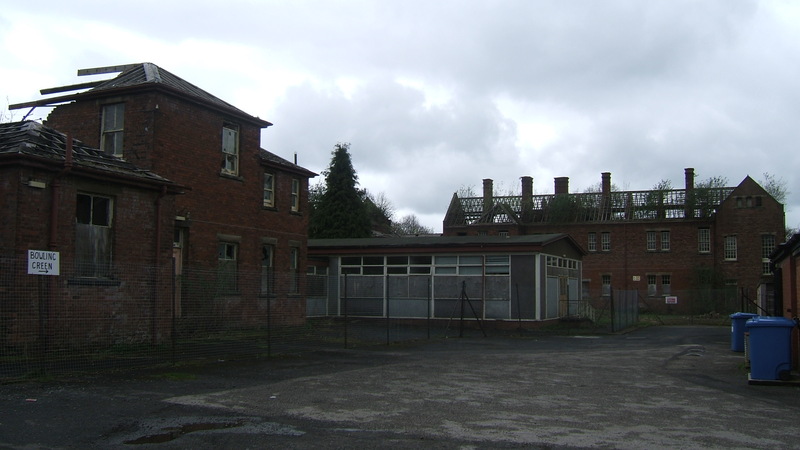 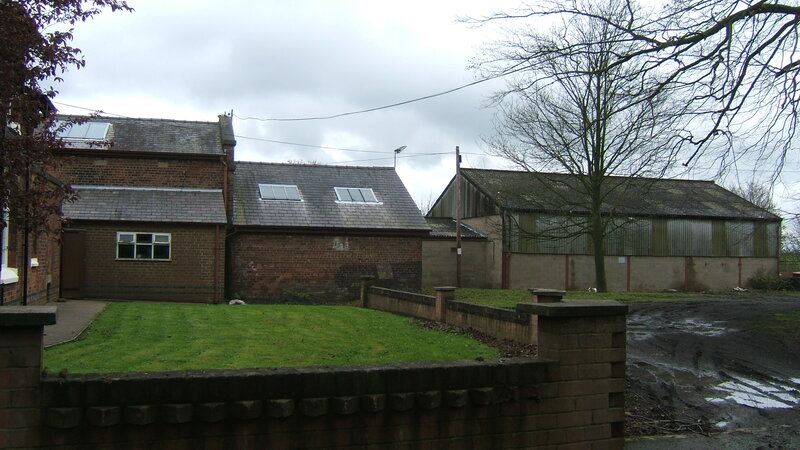 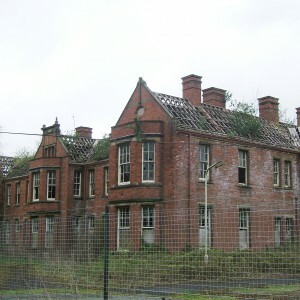 As with all the previously constructed Lancashire Asylums, Whittingham was to be subject to a series of expansion programs through the addition of annexe buildings. 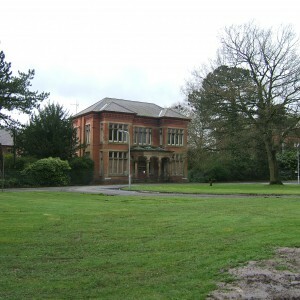 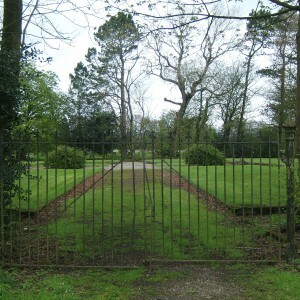 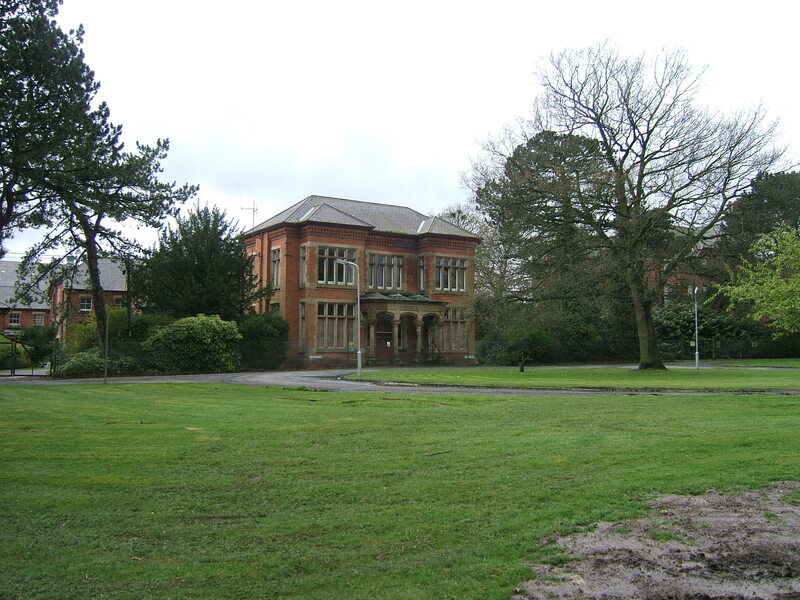 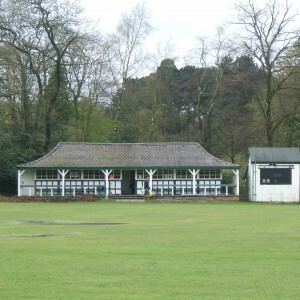 Whittingham was the first to gain an annexe, located to the east of the main drive during 1878-80, also designed by Littler. 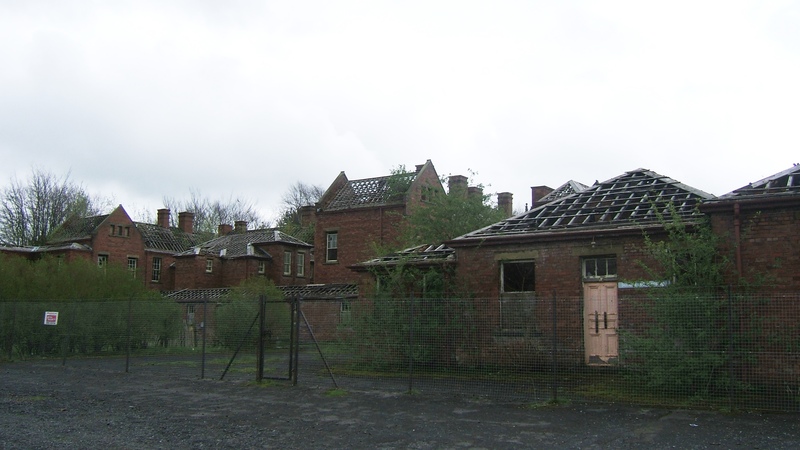 This series of blocks was formed of a series of three storey blocks linked around a rectangular corridor system and was designed to accommodate chronic inmates, whose numbers had begun to build up in the asylum. 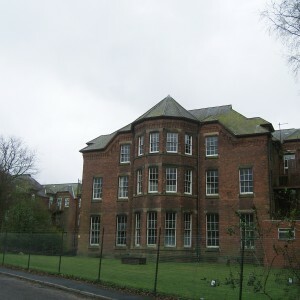 A two-storey entrance block and three-storey doctors residence were located to divide the sexes. 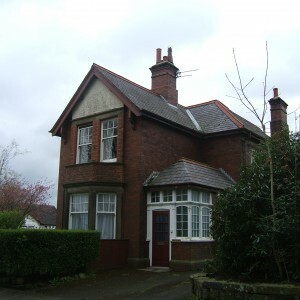 The block was also to contain the asylum’ s own post office. 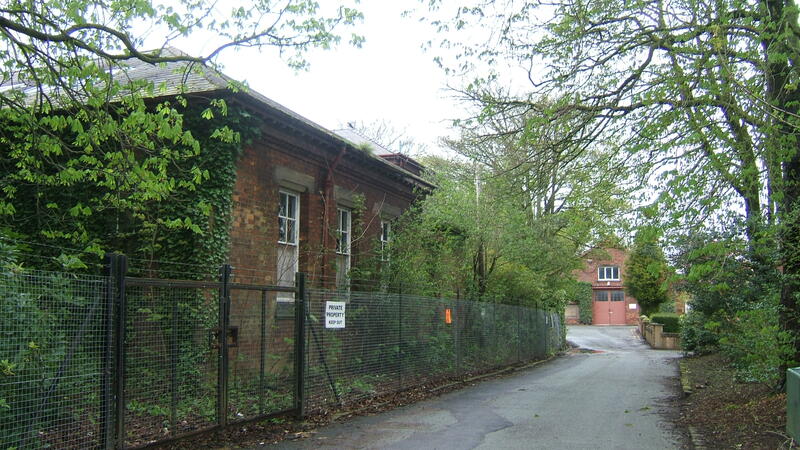 Plans to construct a branch railway had developed from 1884 and constriction commenced in 1887 from the North Eastern Railway line at Grimsargh to provide a goods and passenger service to the site with a platform provided to the east of the asylum complex, opening in 1889. 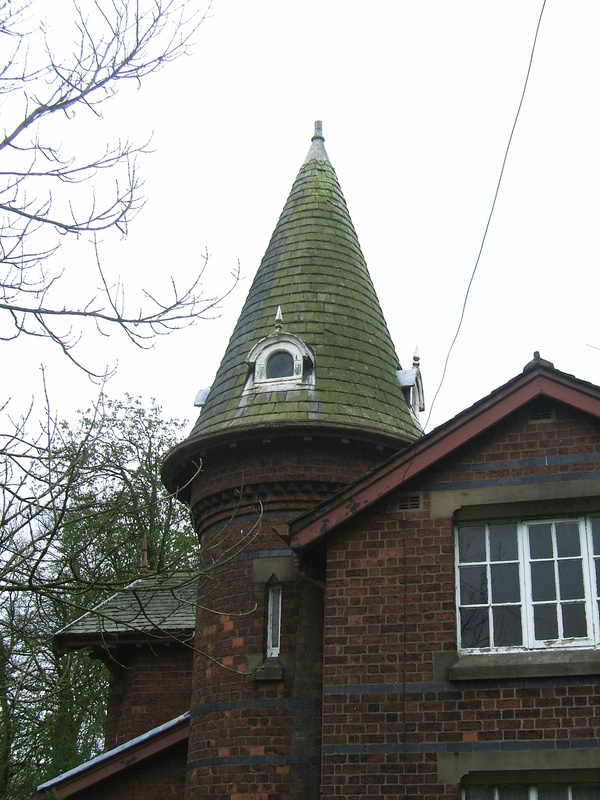 The station itself was re-sited in 1907 and improved to include an overall roof, with the original becoming an engine shed. 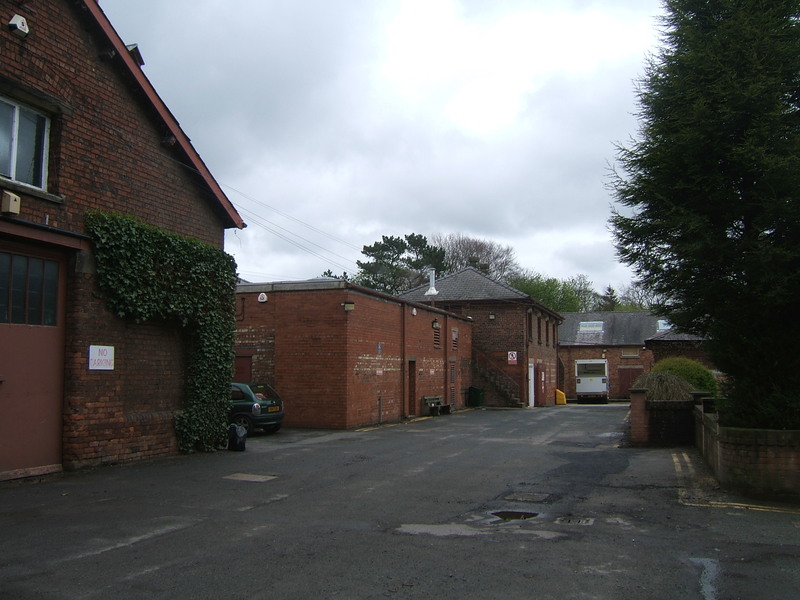 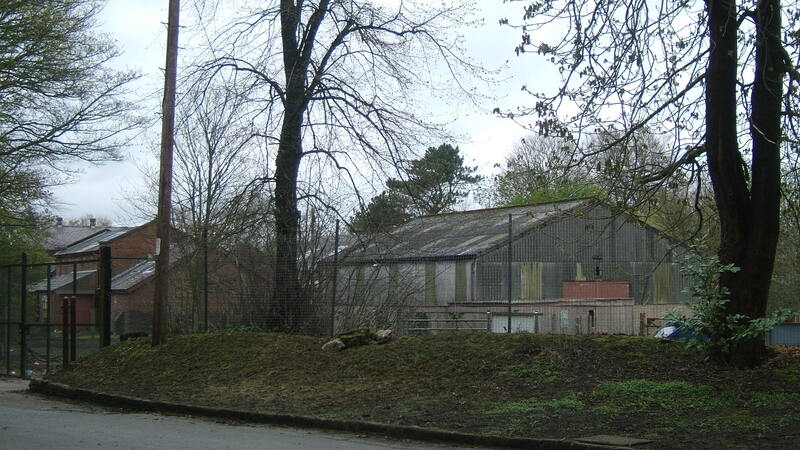 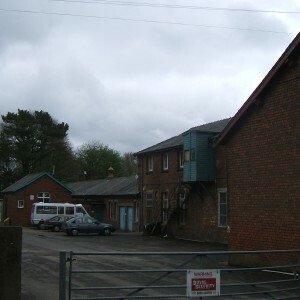 A Goods yard was provided alongside the maintenance workshops. 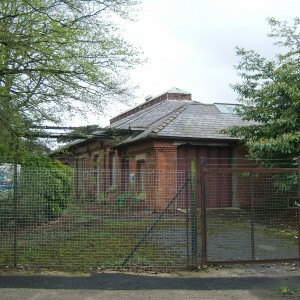 When the boiler house was expanded in 1912 a continuation of the line was laid past the front of the main, with a spur to coal staithes near to the Hermitage. 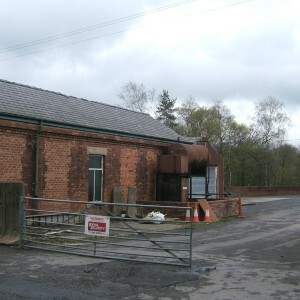 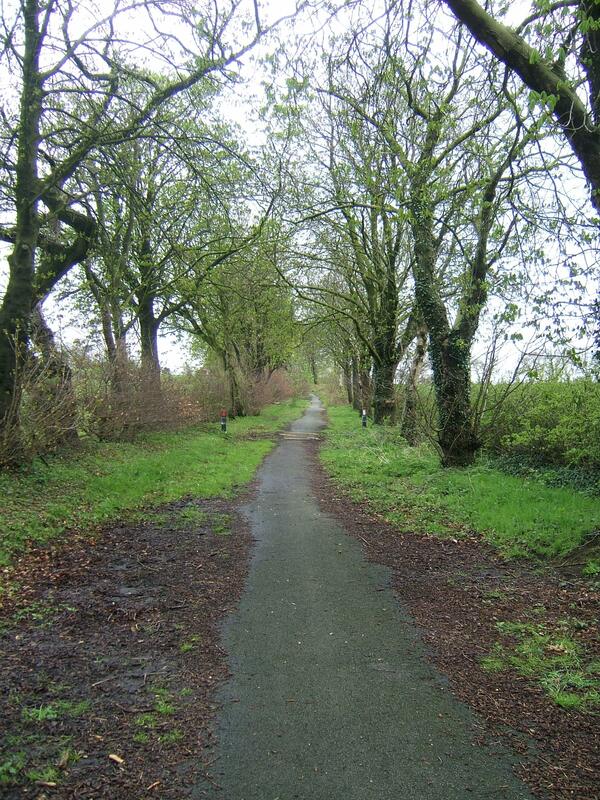 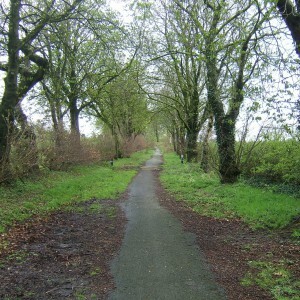 Passenger services, which had always been free continued between Whittingham and Grimsargh until closure on 30th June 1957 although the latter had lost it’s connecting passenger services as early as 1930. 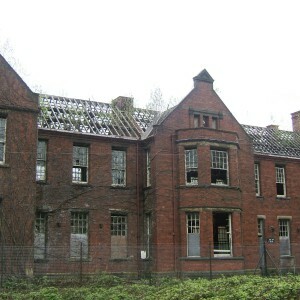 Fryars Villa, named after Chairman of the Visiting committee, was constructed in 1884 to the east of the main complex as an isolation hospital for inmates with infectious diseases. 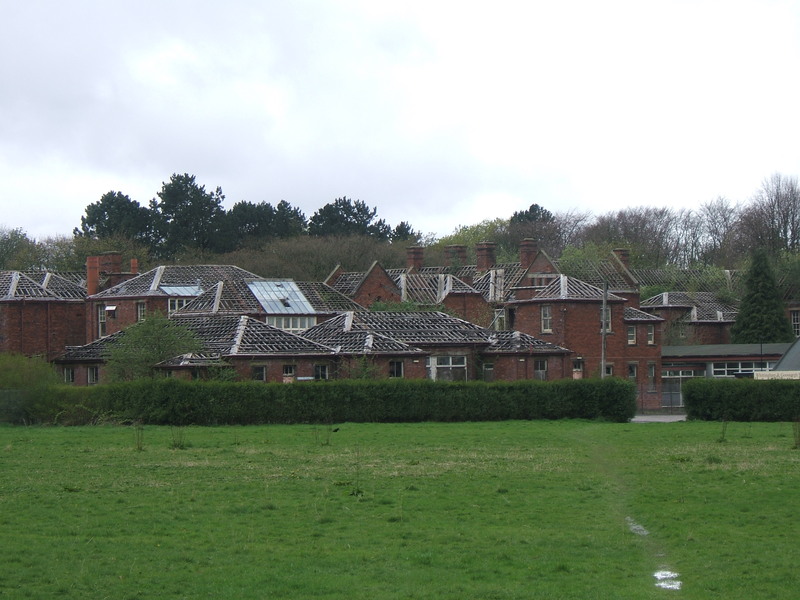 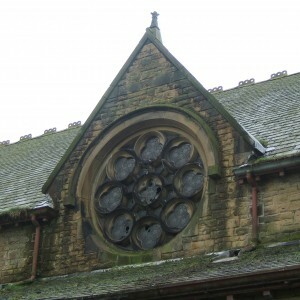 The Lancashire Asylums Act of 1891 brought about the formation of the Lancashire Asylums Board which would from thereafter manage the existing institutions at Lancaster, Prestwich, Rainhill and Whittingham. 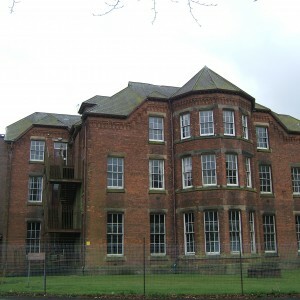 This enabled a degree of autonomy from the County Council in the management of the asylums and enable better co-ordination of services across the service. 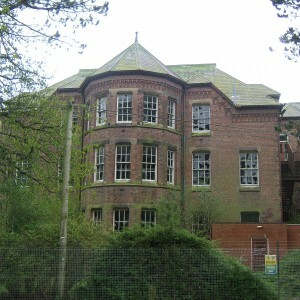 A further complex was added between 1897 and 1900, again to Littler’s designs. 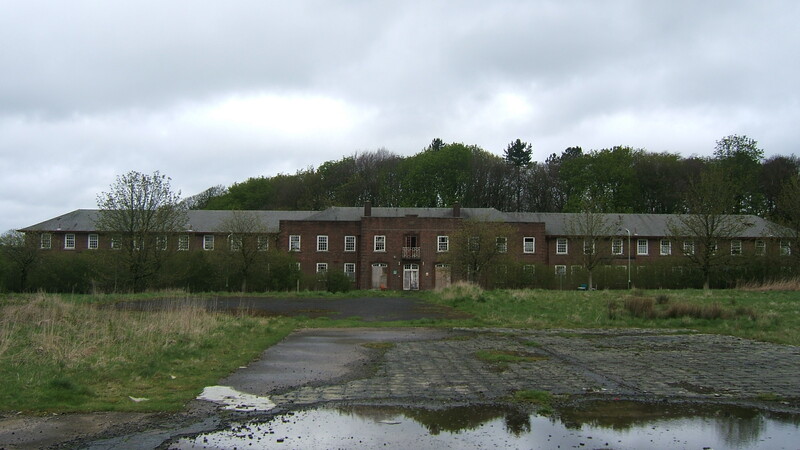 This was intended primarily as an acute and sick hospital complex formed of two blocks for each type of patient for males and females. 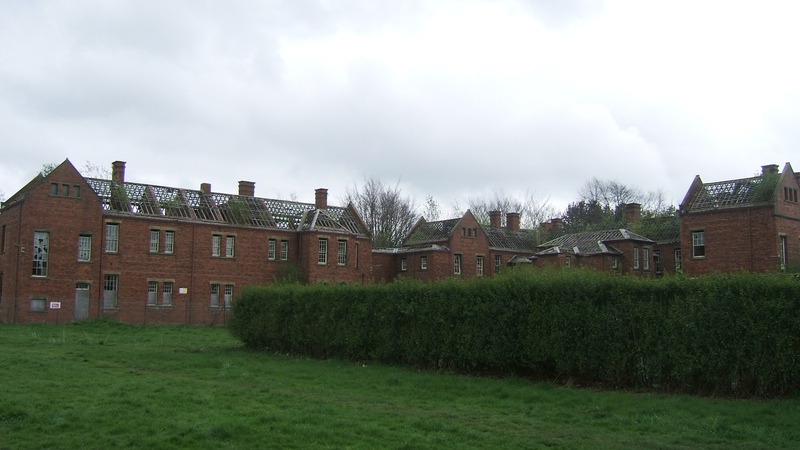 The complex had it’s own kitchen and dining facilities as well as two integrated dwellings for senior staff. 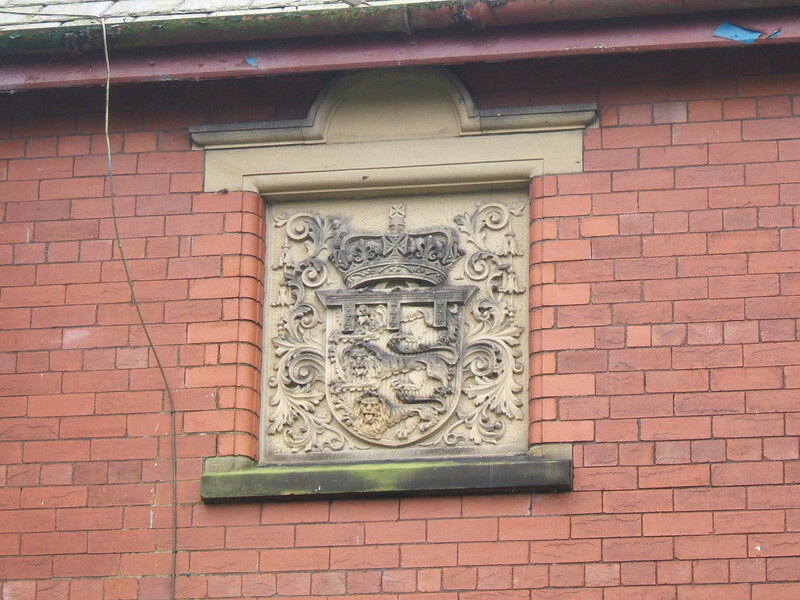 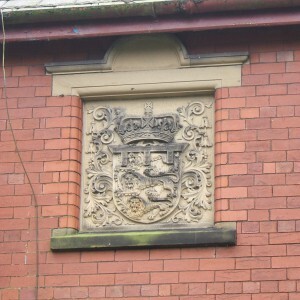 At the south of this echelon complex was placed a small entrance block and visitors to this area were provided with a mosaic of the Coat of Arms of Lancashire County Council. 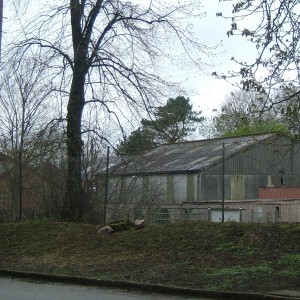 The buildings were similar in style and materials to the existing buildings on the site. 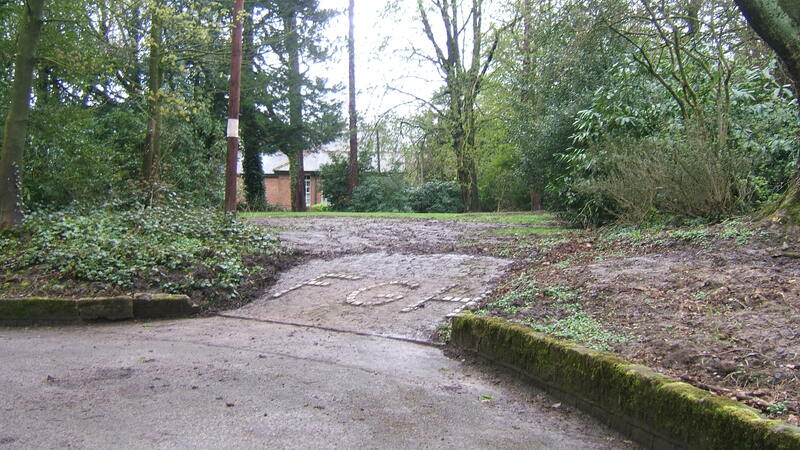 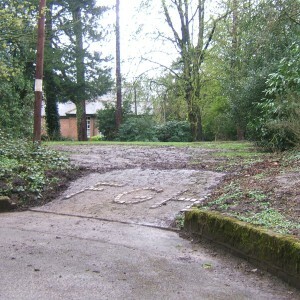 An additional driveway to the west of this complex was upgraded and a entrance gate provided. 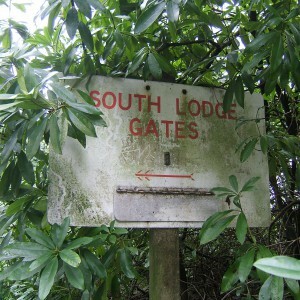 New Lodge was built at this gate in a style matching the acute hospital complex. 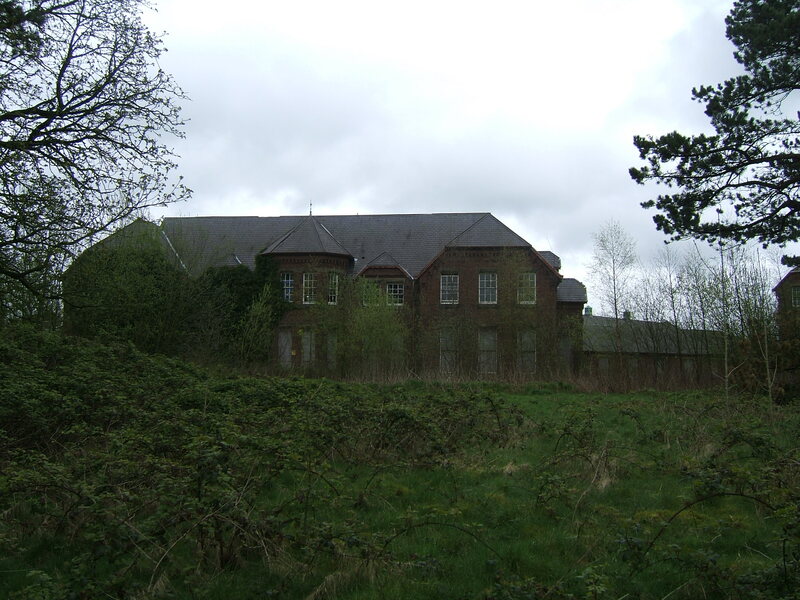 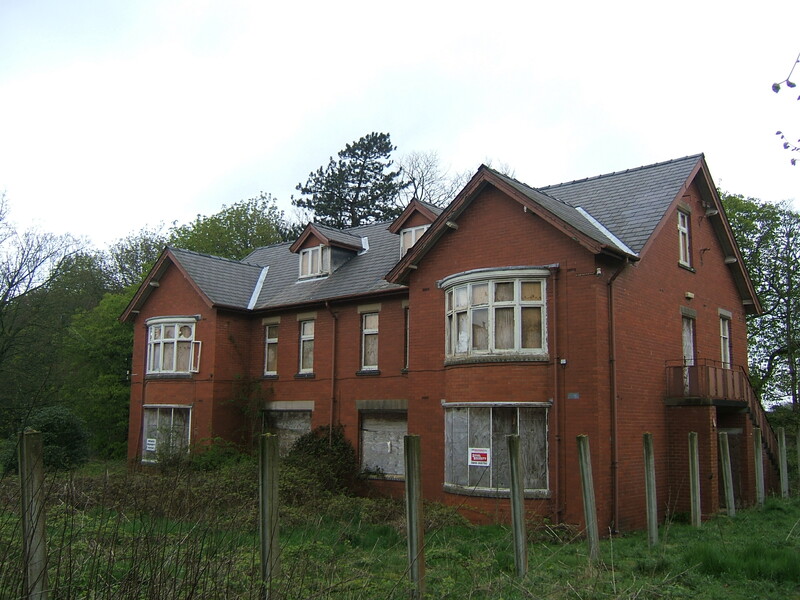 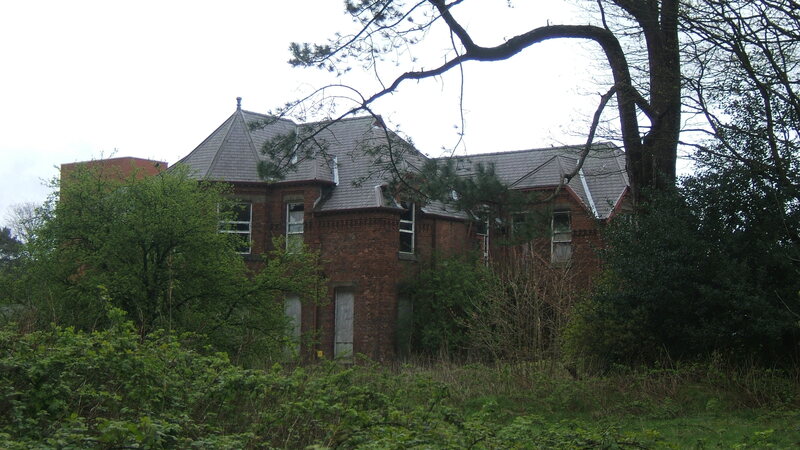 The complex was subsequently named Cameron House after the asylum’s pathologist Dr. John A M Cameron. 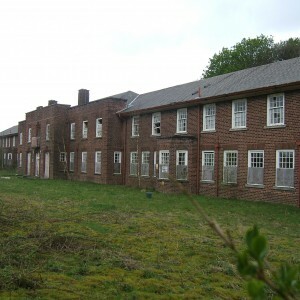 Another major construction scheme was commenced in 1912-14 prior to the commencement of World War I with the development of the third and final annexe on the site. 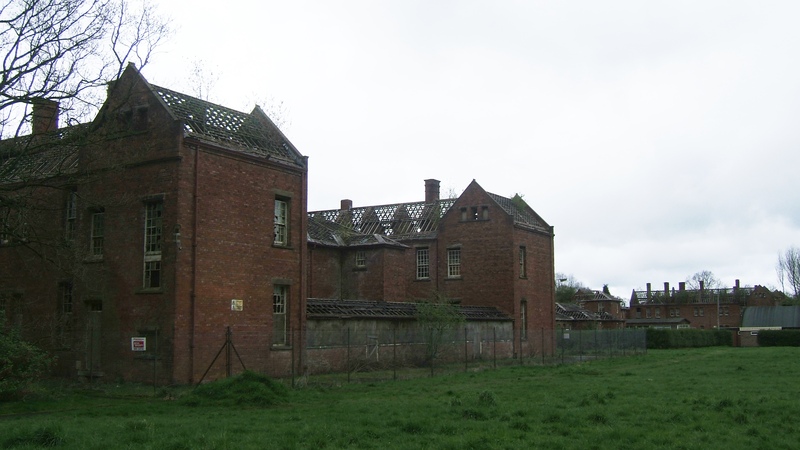 This was initially known as the West Annexe and consisted of another range of wards with entrance block and medical officer’s residence, again by Henry Littler. 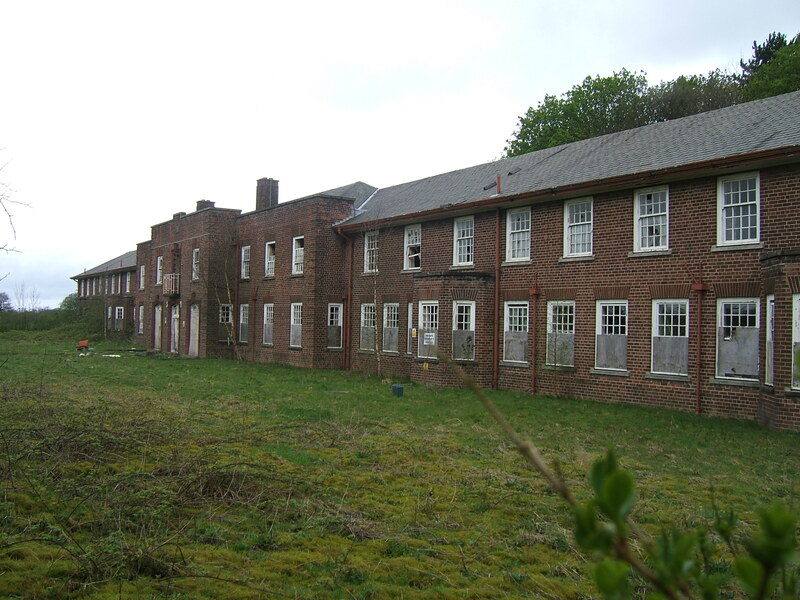 The complex was consisted entirely of two-storey blocks with single storey linking corridors. 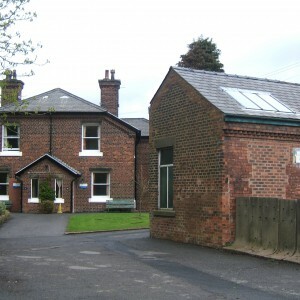 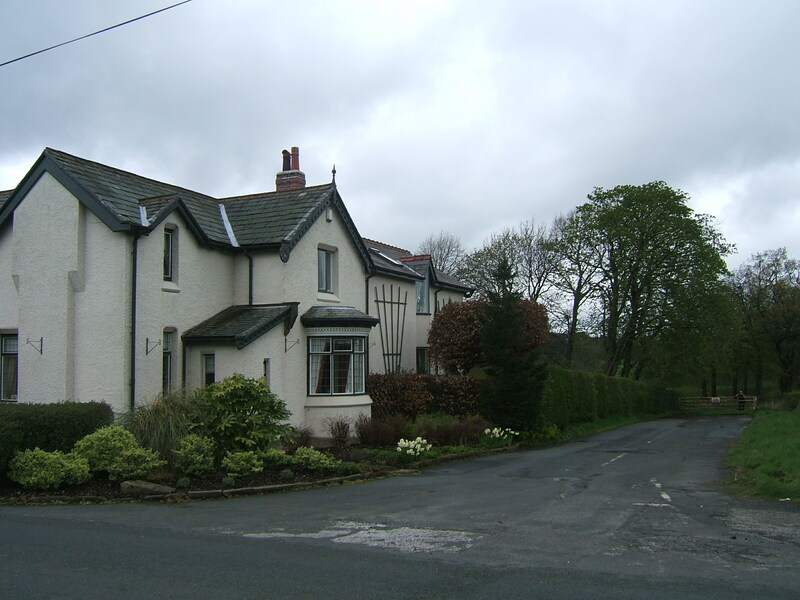 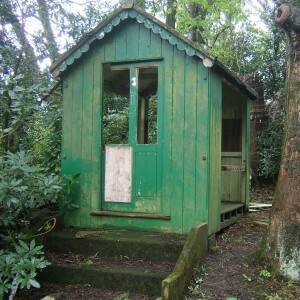 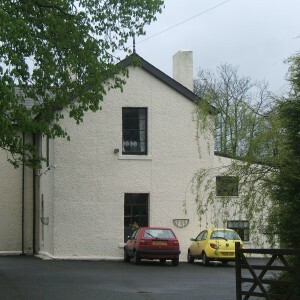 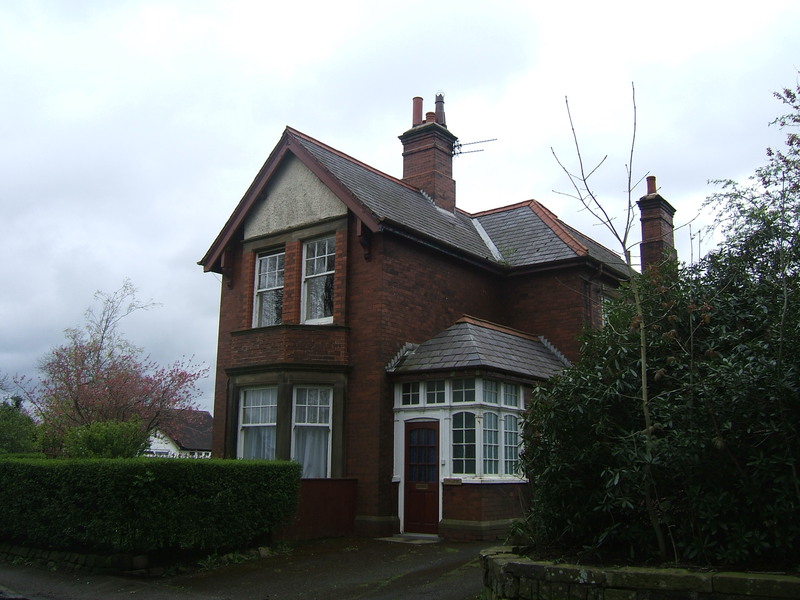 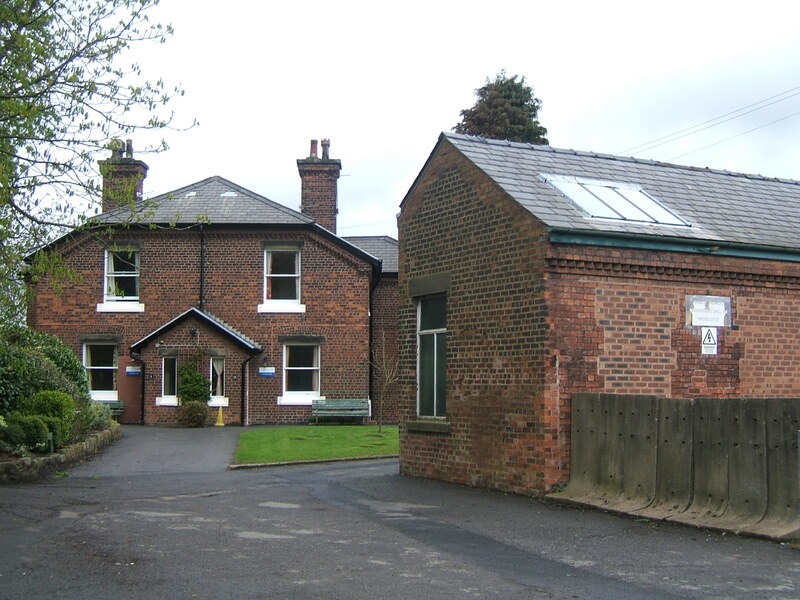 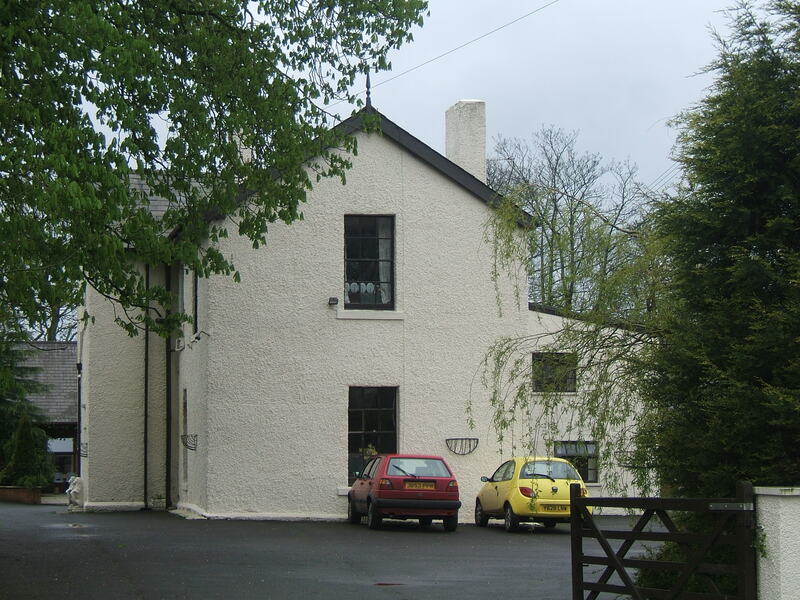 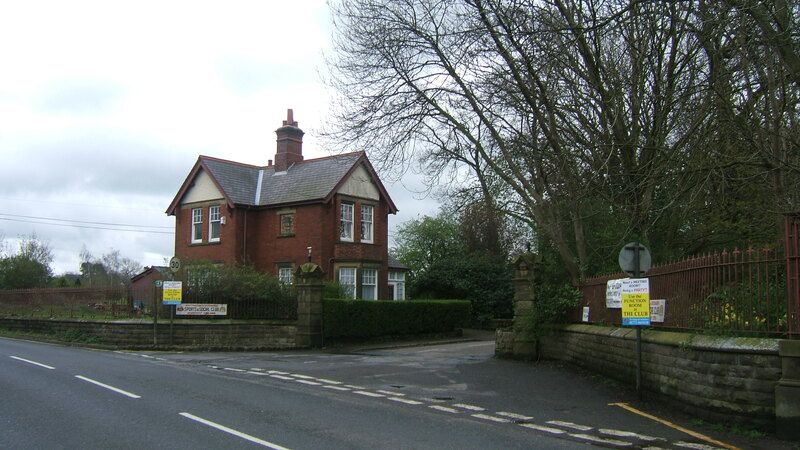 A further lodge cottage, West Lodge was placed on the drive from Goosnargh to the acute and sick hospital. 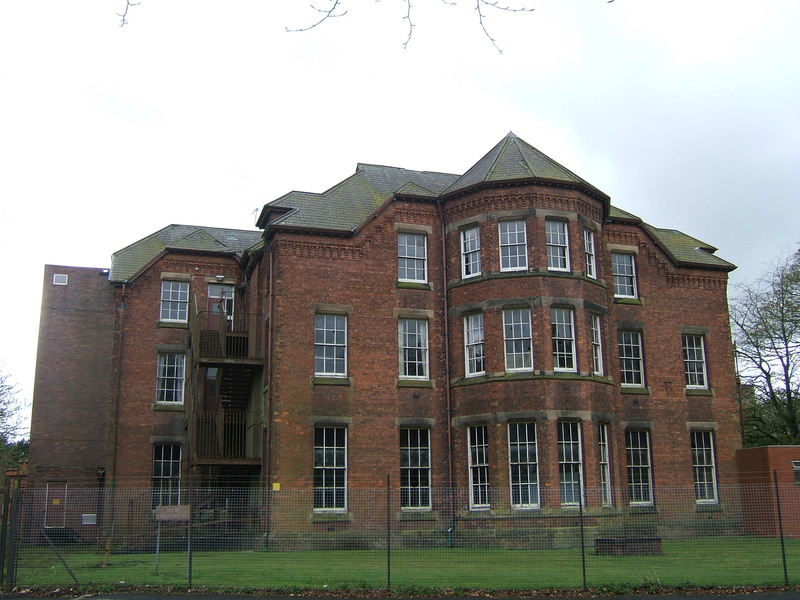 The Great War brought major changes to the management of all of the Lancashire Asylums Board mental illness institutions. 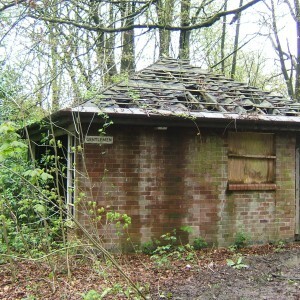 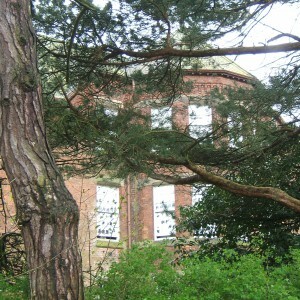 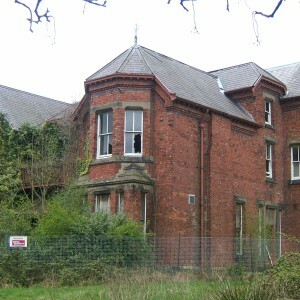 The Lancashire asylums were placed into a cluster with asylums in Cheshire and Derbyshire forming the Group 3 hospitals. 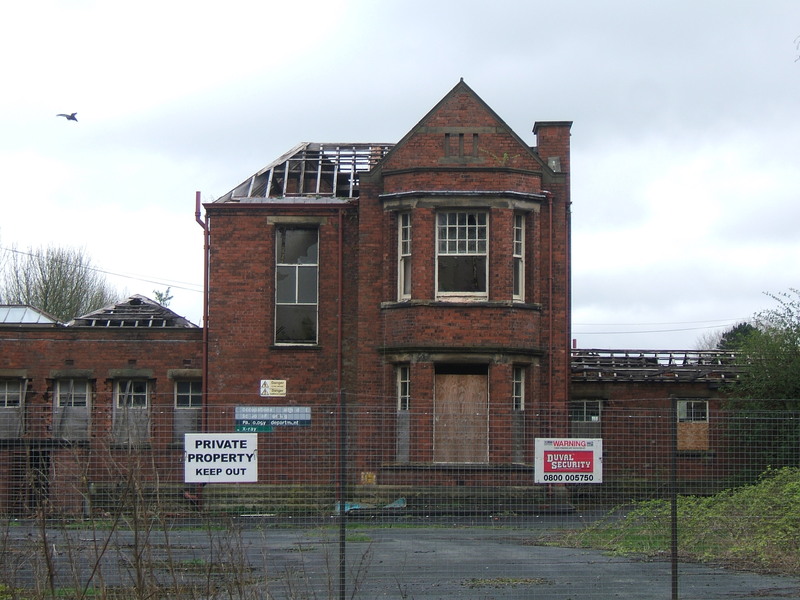 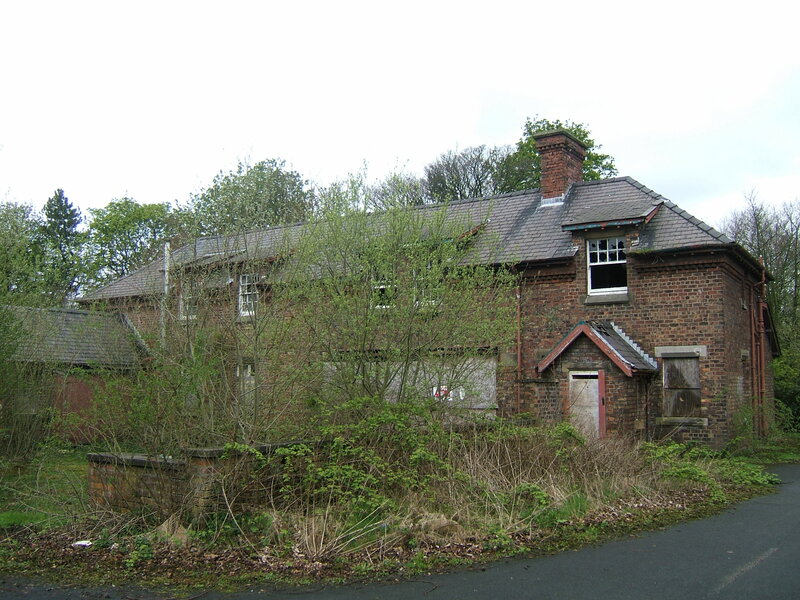 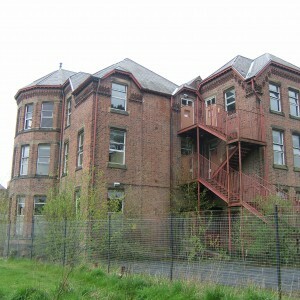 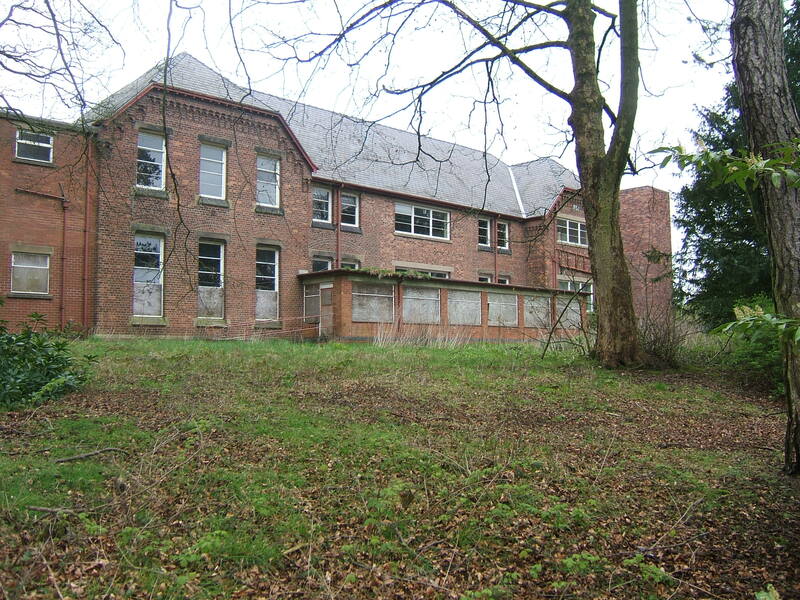 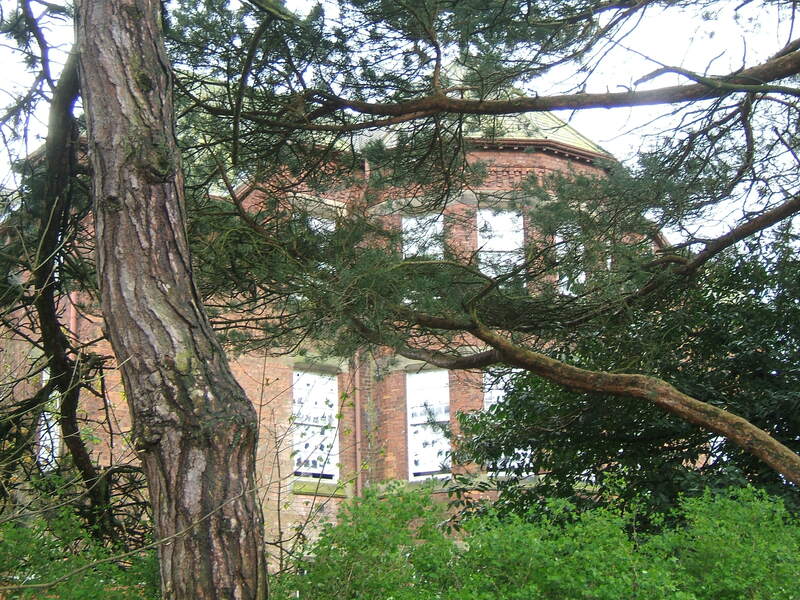 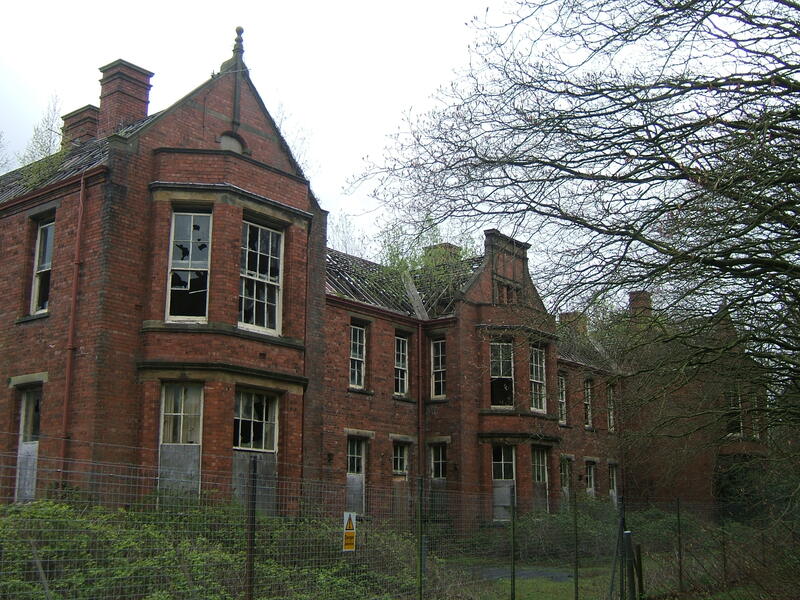 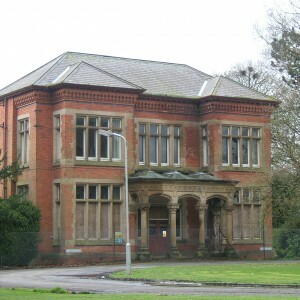 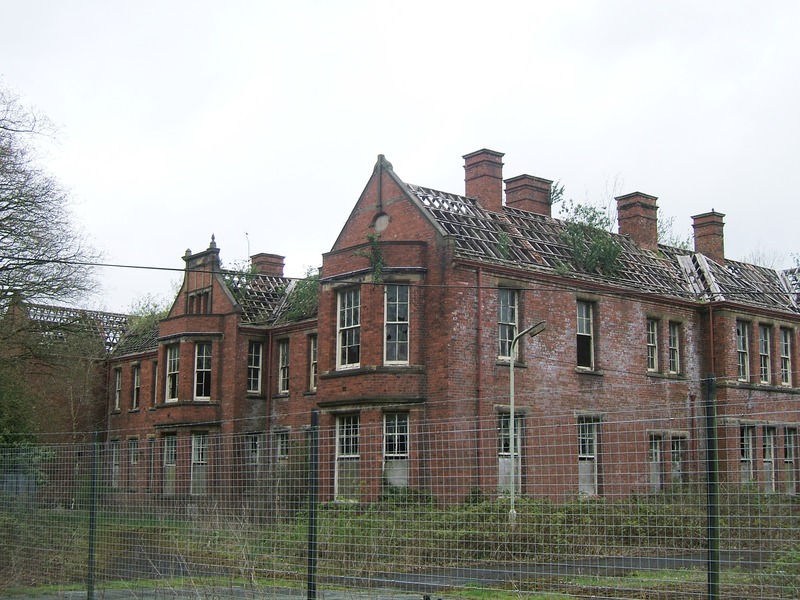 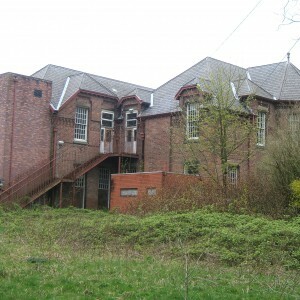 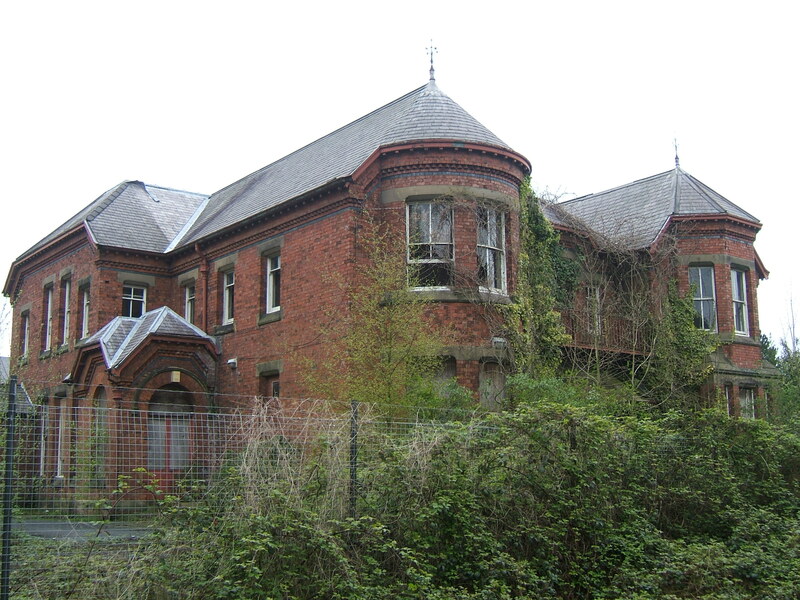 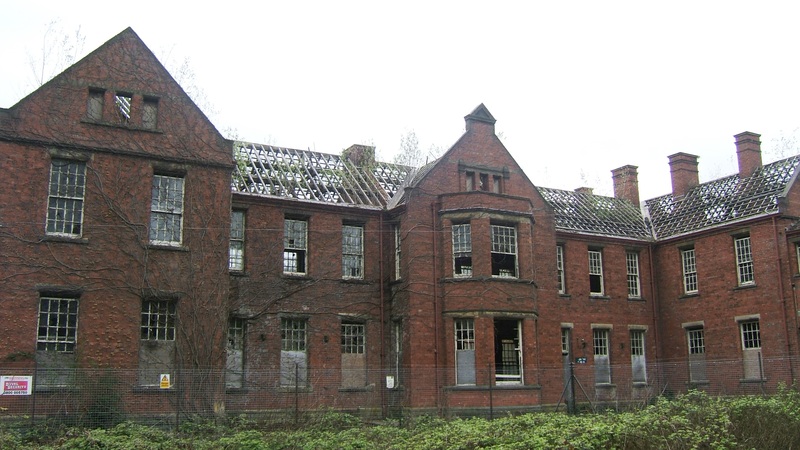 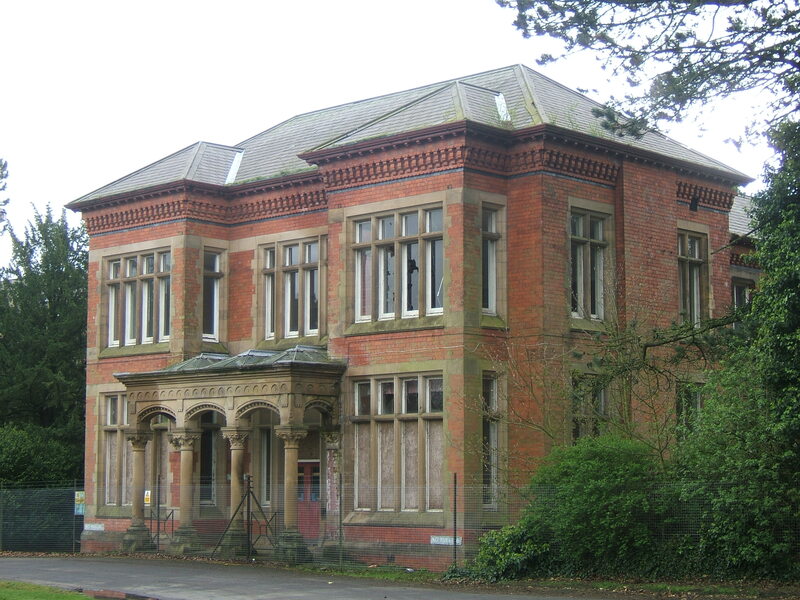 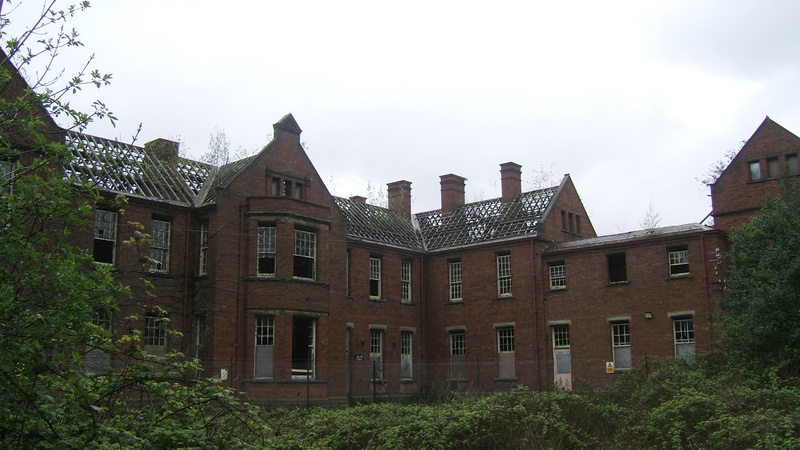 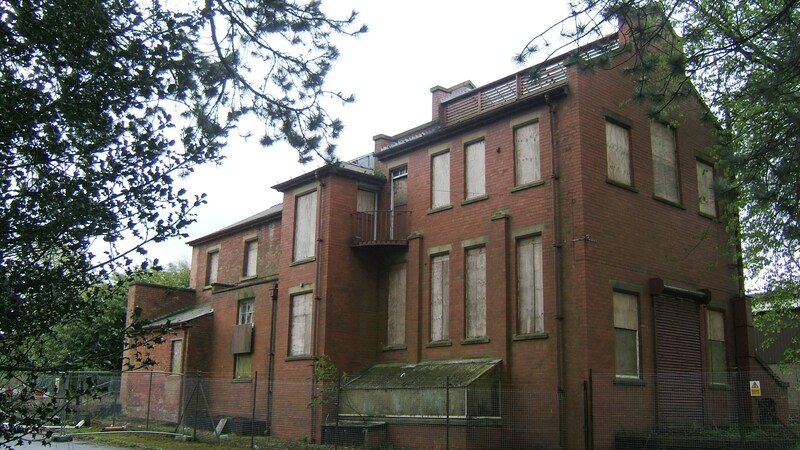 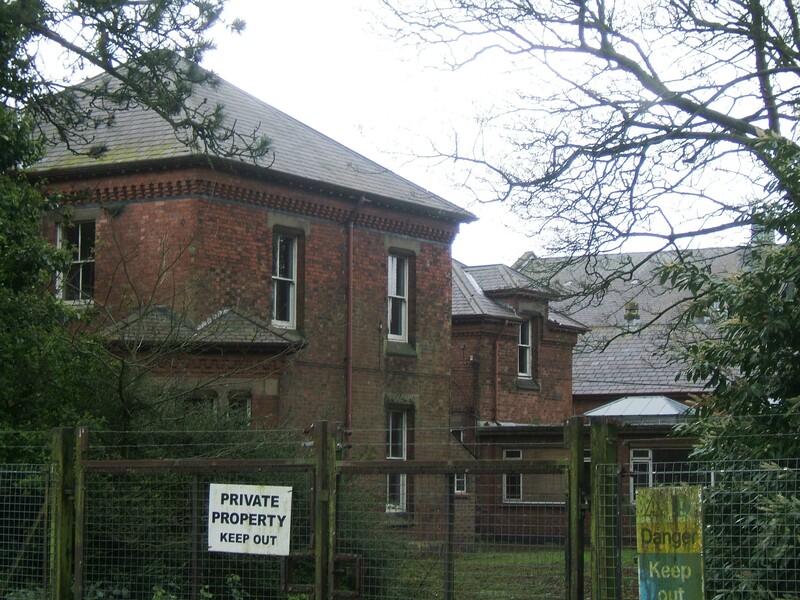 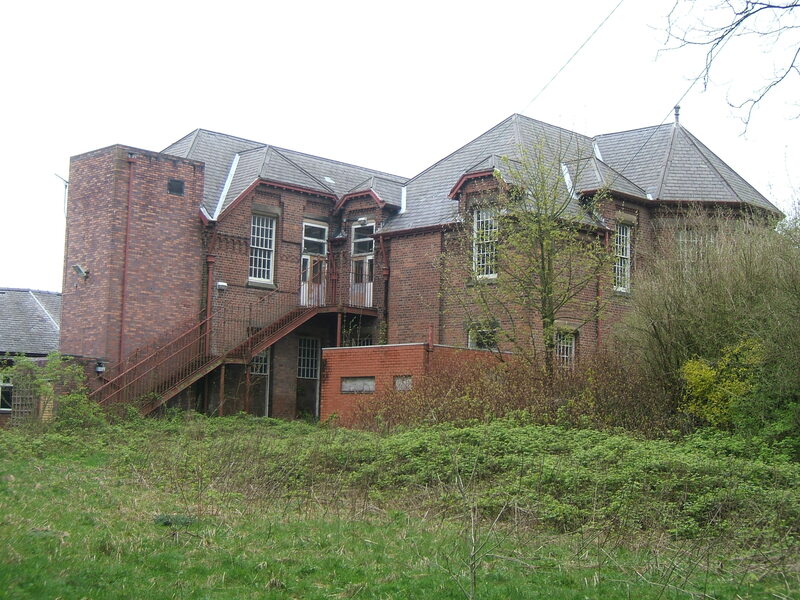 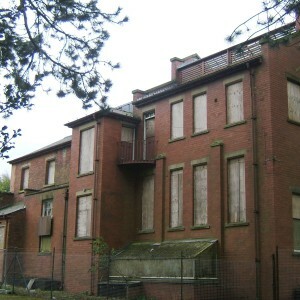 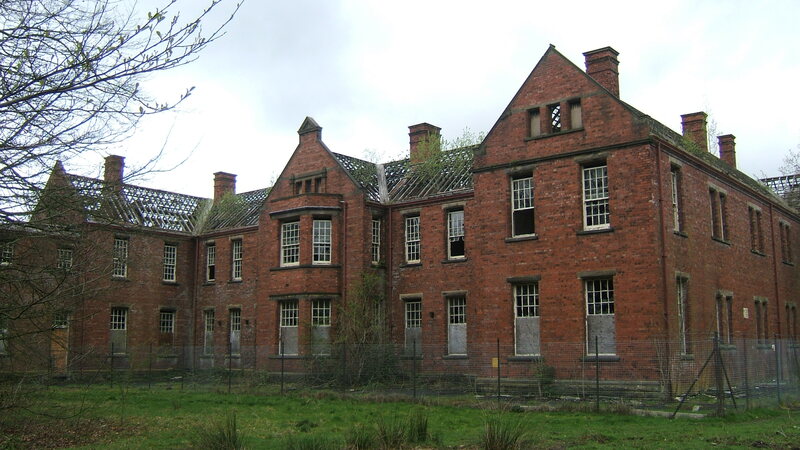 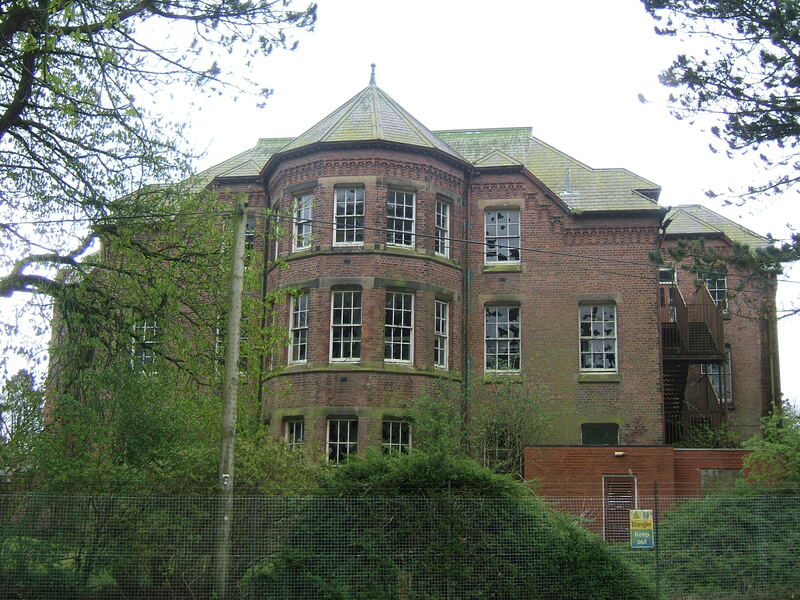 Within group 3, the Winwick Asylum, near Warrington was designated as a vacating hospital with the others in the same group becoming receiving hospitals. 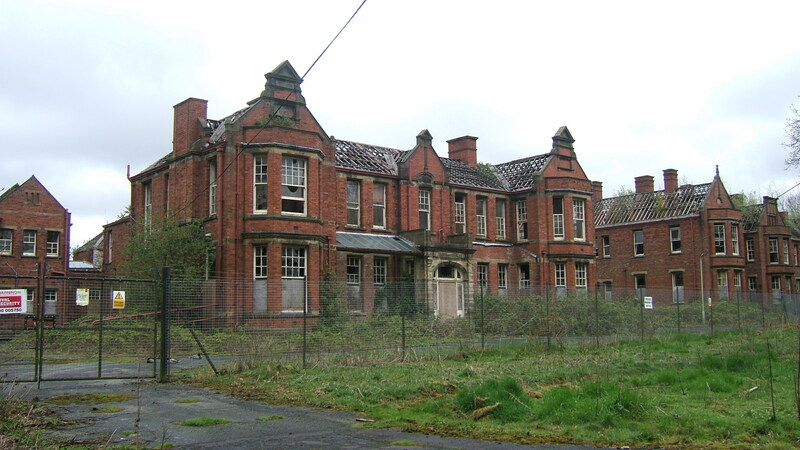 Winwick then became the Lord Derby War Hospital, used for the treatment of military casualties.. 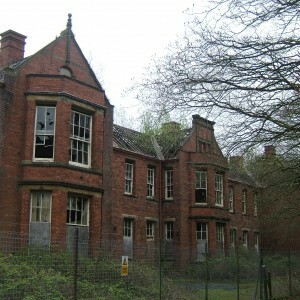 The vacating hospital was then evacuated of its’ patients to the receiving hospitals. 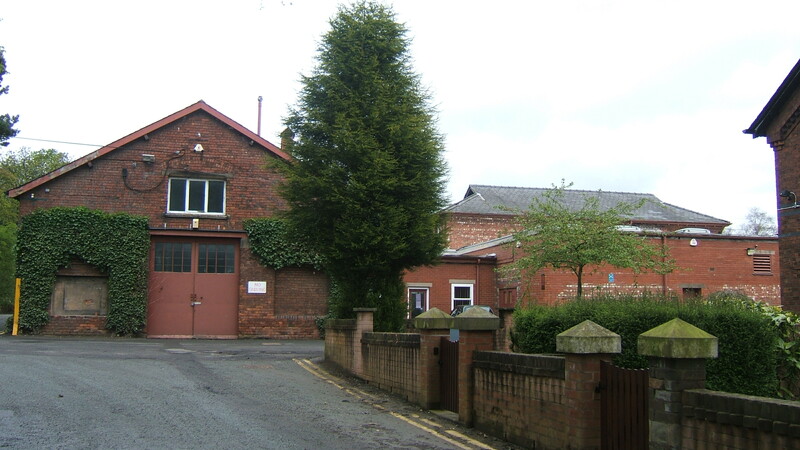 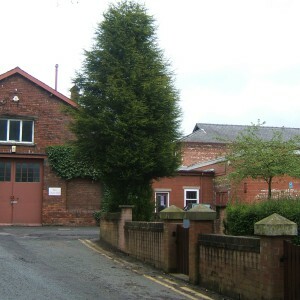 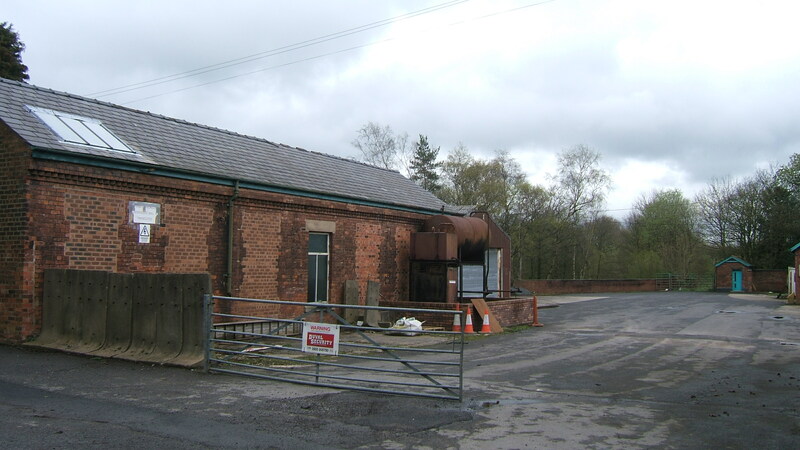 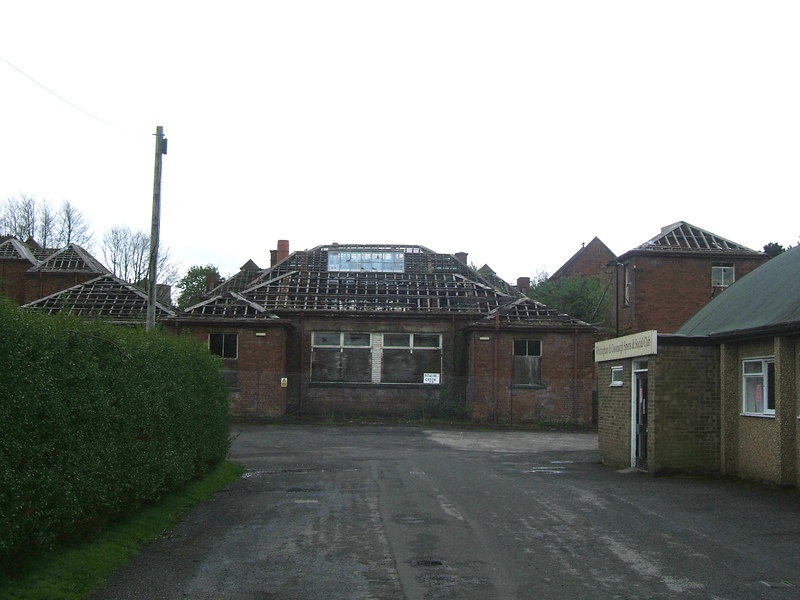 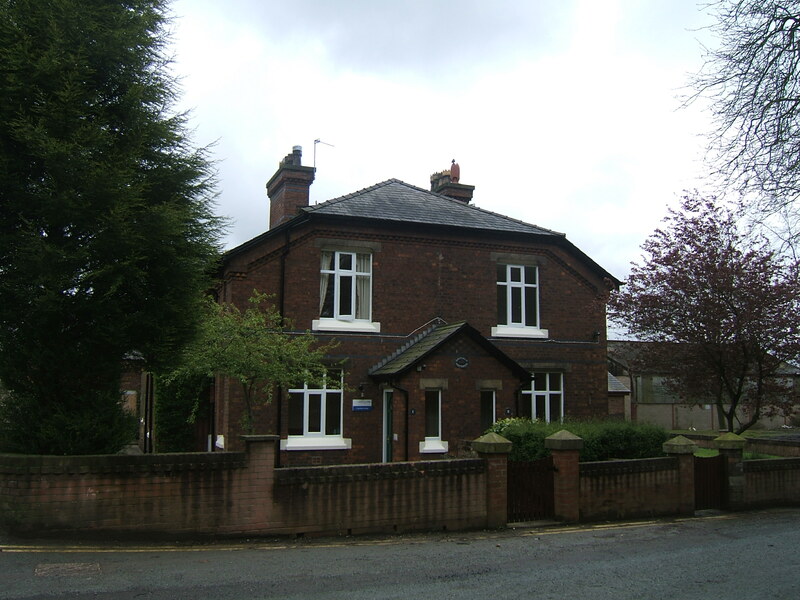 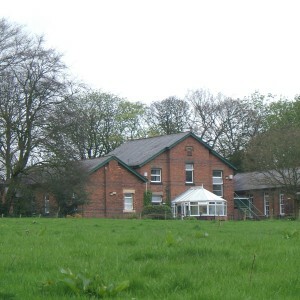 As well as being a receiving hospital for Winwick Asylum, Whittingham made available the use of the newly completed West Annexe for the War effort as the Whittingham Military Hospital between 1918 and 1919. 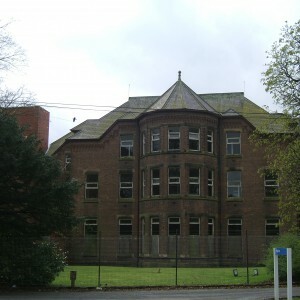 The incomplete and as yet unopened Whalley Asylum was also hurriedly finished and utilised as the Queen Mary’s Military Hospital. 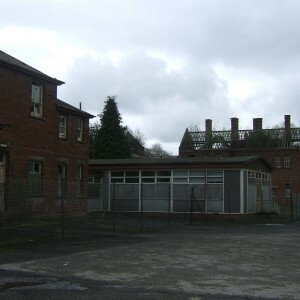 With a return to civilian use and transfer of patient’s back to Winwick, Whittingham was able to expand back into the West Annexe, reducing overcrowding in other areas of the complex. 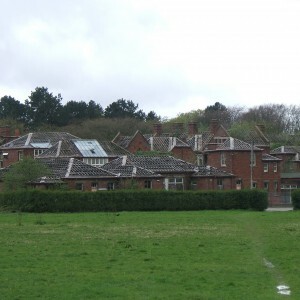 The interwar period saw limited development at Whittingham, which was already a substantial complex. 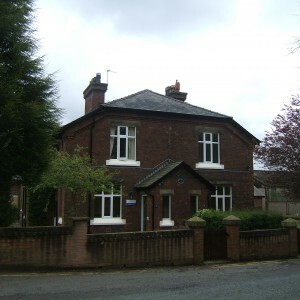 A pair of residences for senior staff was provided along with a sizeable female nurse’s home, both located to the north of the West Annexe. 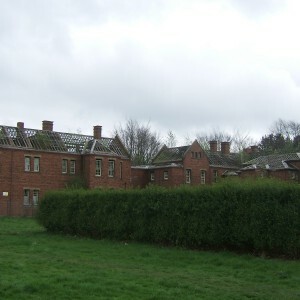 Further ward blocks were added to the Annexe and West Annexe complexes during the mid 1930’s. 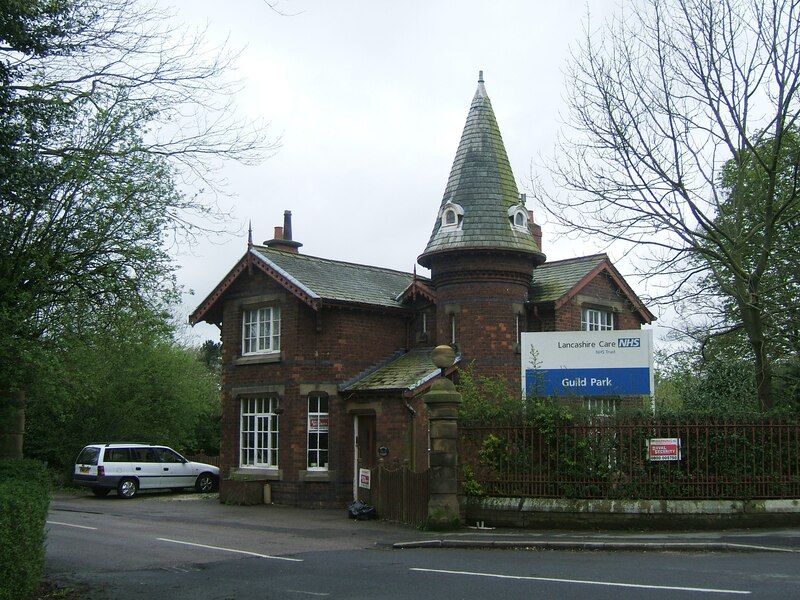 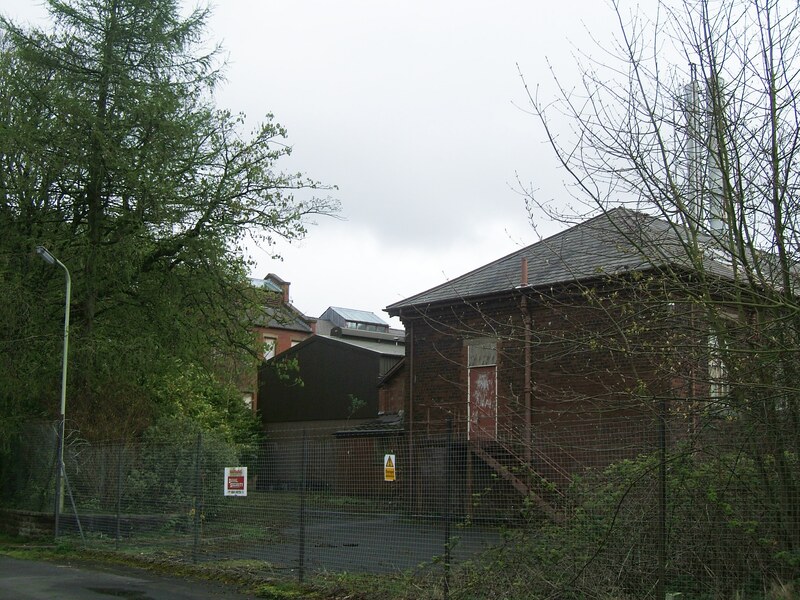 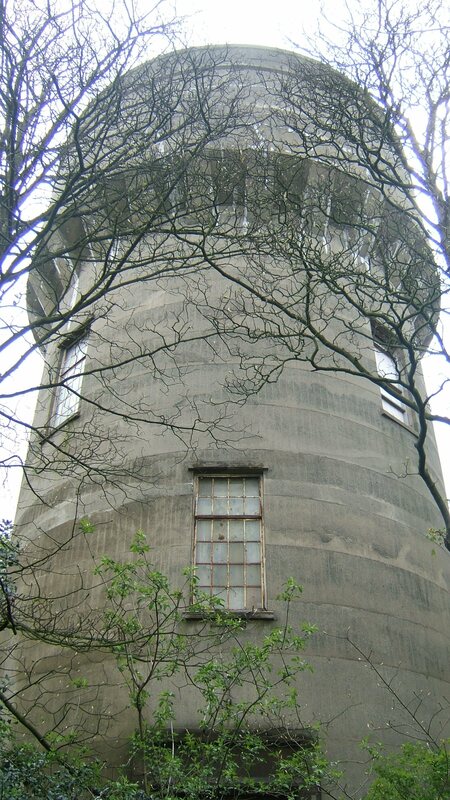 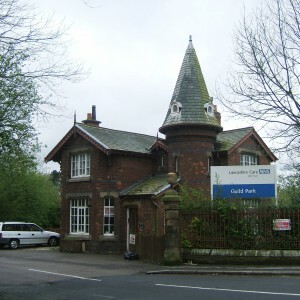 The gas works to the south of the station and maintenance yard was closed and dismantled, A functional concrete water tower was constructed in 1945 to serve the hospital located on the site of the original mortuary, between the main building and West Annexe. 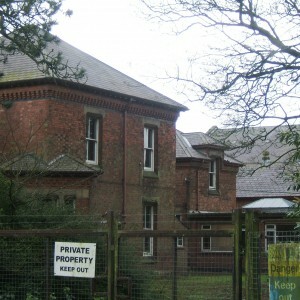 World War II did not require the level of military involvement in asylum occupation as it had in the First World War. 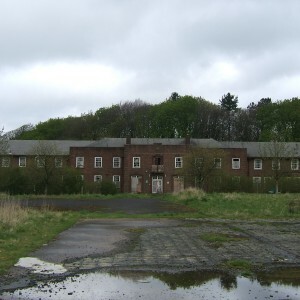 The hospital was however at some of its highest rates of occupancy and reached a capacity of over 3, 500 patients with a reduced numbers of nursing staff due to military service. 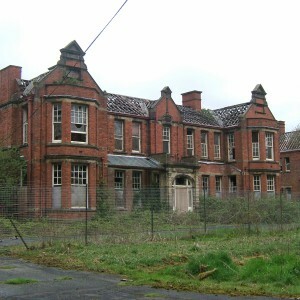 During this period and the subsequent creation of the National Health Service, the hospital became the largest mental hospital in the United Kingdom. 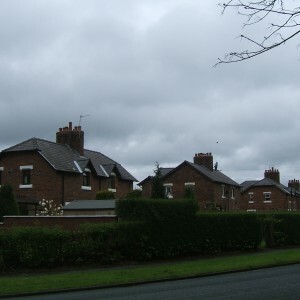 Lancashire in general had high capacity levels at most of its’ asylum due to the policy of developing large annexes on existing sites rather than numerous smaller institutions. 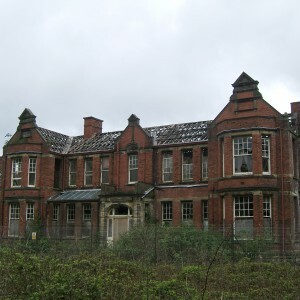 The NHS saw the abolition of the Lancashire Mental Hospitals Board, formerly the Lancashire Asylums Board, and the hospitals were passed to hospital management committees overseen by regional hospital boards and were no longer necessarily connected to their previous sister asylum in the way they had previously done. 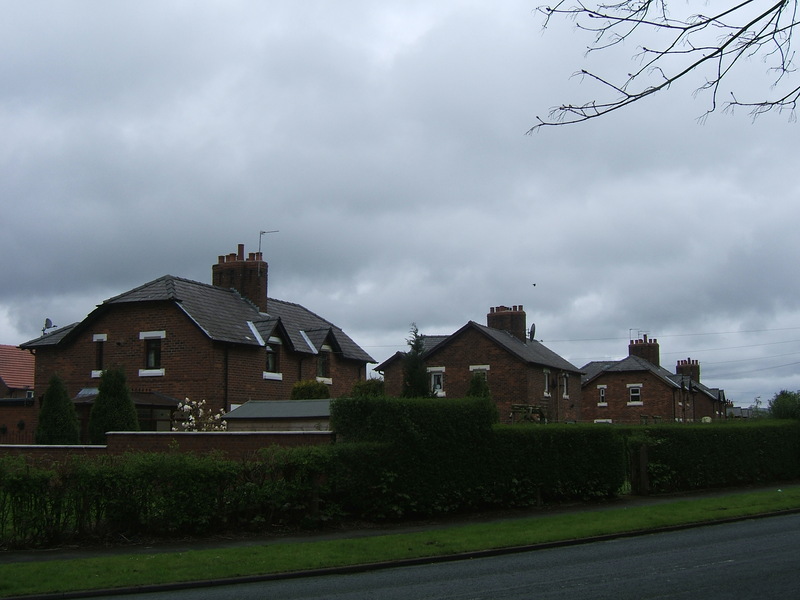 Naming of buildings changed in 1958 as the various annexes took on new identities. 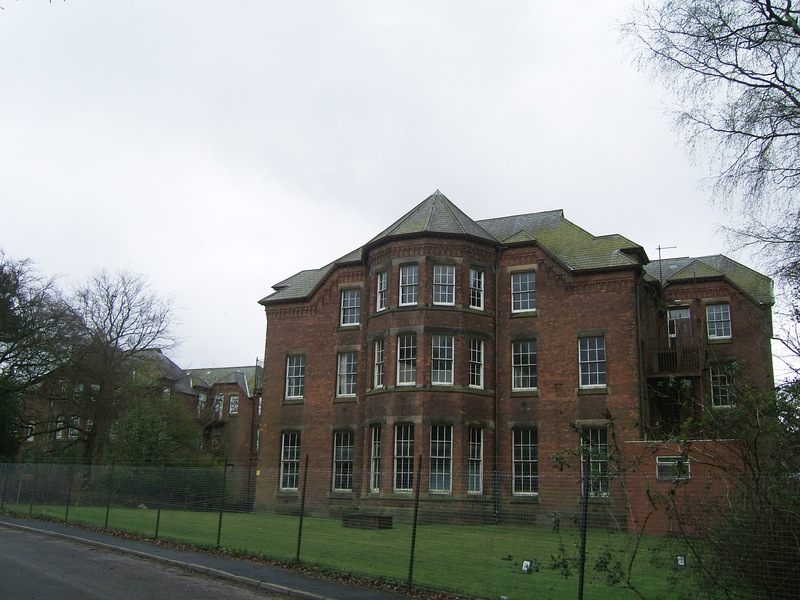 The main building became St. Luke’s division; the annexe became St. John’s,, the west Annexe – St. Margaret’s and the hospital wards – Cameron House. 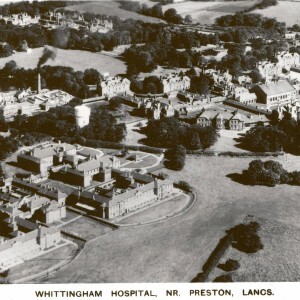 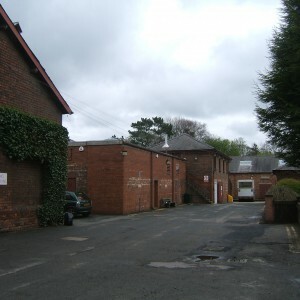 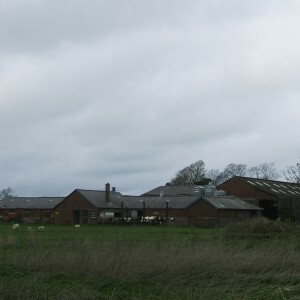 At Whittingham , new facilities were developed to include industrial and occupational therapy services and the hospital farms which had previously been a source of employment and economic support to the patients and hospital were gradually privately leased or sold after official guidance from the Ministry of Health dictated their disposal. 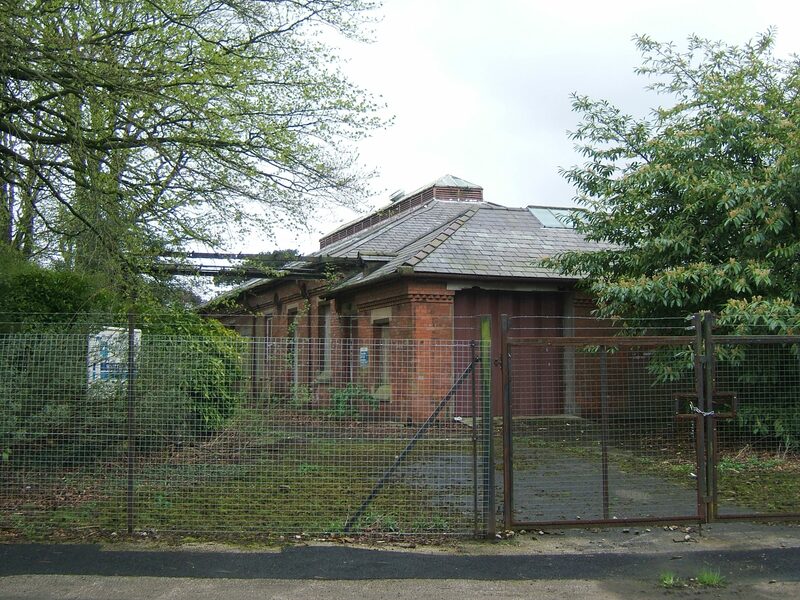 Use of the railway line ceased in 1957 as road transport gained prominence at the cost of railways and the building of a new power plant meant that the change of boiler fuel from coal to oil rendered it obsolete. 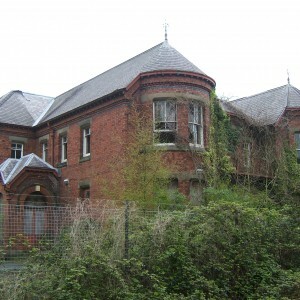 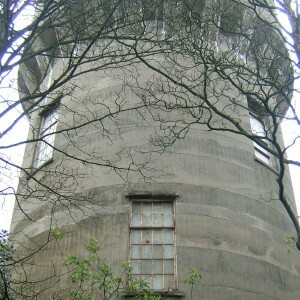 The 1960’s proved to be a challenging decade for Whittingham after Enoch Powell’s infamous Water Tower Speech drew attention of the public to the mental hospitals and their inpatient populations. 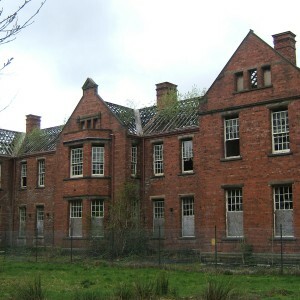 The prospect of eventual closure, brought inevitable concern to staff, some of whose families had worked in the asylum for generations. 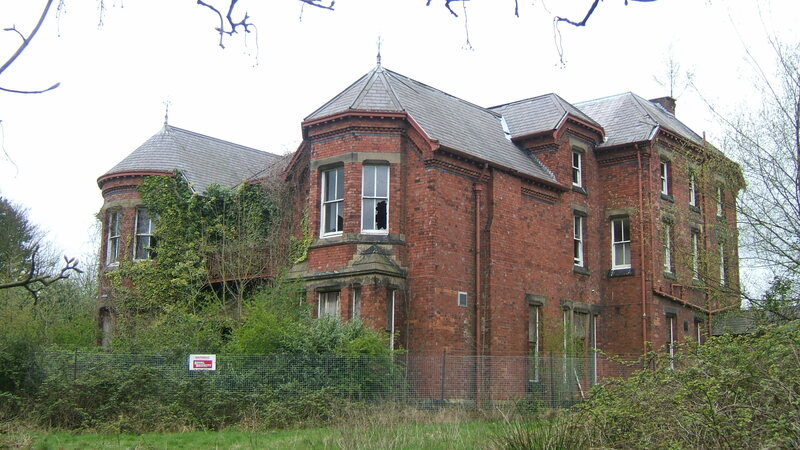 New ideas and experiments for in psychiatry had come into vogue along with the large-scale introduction of anti-psychotic medication allowing formerly long stay patients to be discharged. 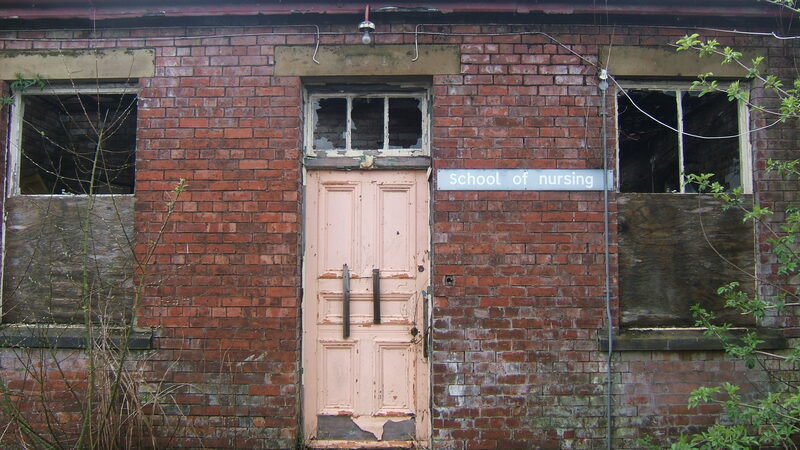 New ideas clashed with old traditions and regimes. 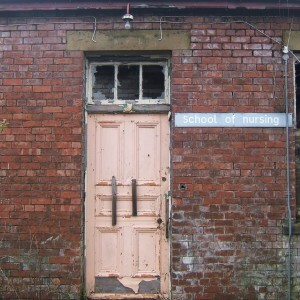 Entrenched abusive behaviour was brought to light in 1967-9 by student nurse’s, prompting an Inquiry into the behaviour of staff on certain wards as well as ill treatment, corruption and poor conditions in a period where mental hospital scandals frequently made headlines. 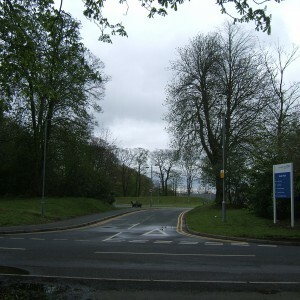 Whittingham allowed the filming of a documentary of life in the hospital to take place, fronted by presenter Ray Goslin in 1980, examining the patient’s facilities, treatment and future at the hospital. 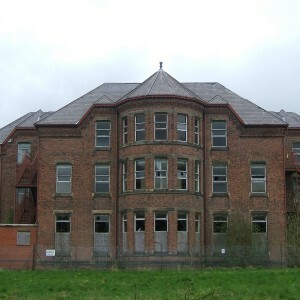 By the 1980’s the inpatient population was being steadily reduced as new long stay admissions were being prevented and admission and acute facilities were re-sited in the District General Hospital Units within the area. 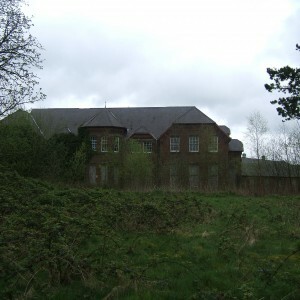 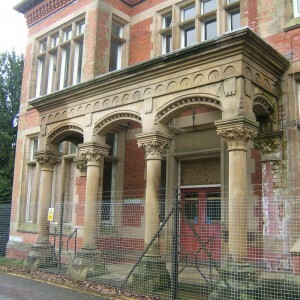 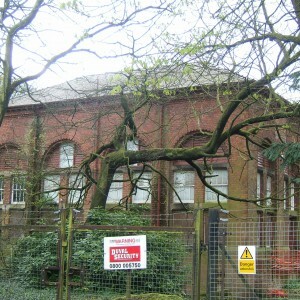 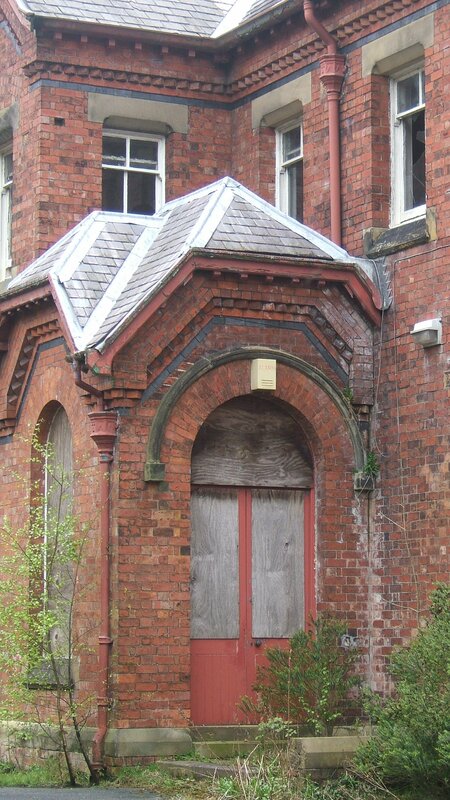 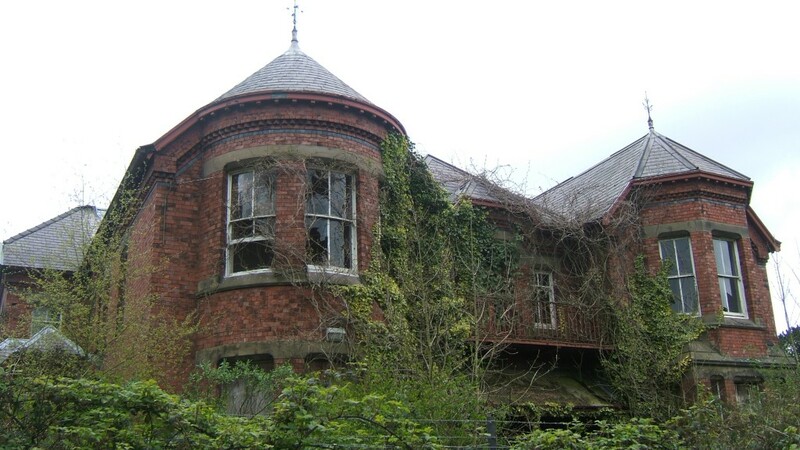 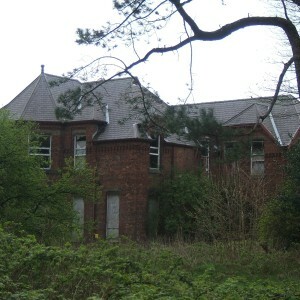 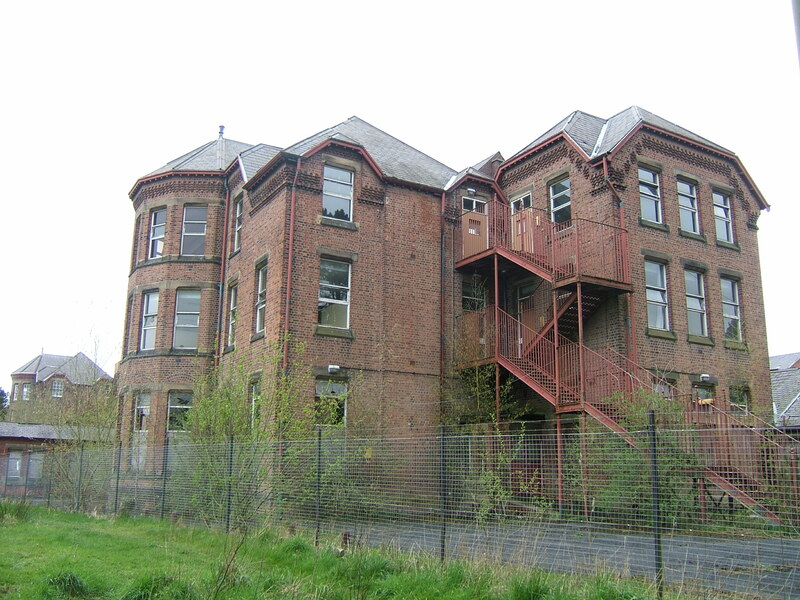 St John’s, St. Margaret’s and Cameron House divisions were gradually closed in favour of concentrating the remaining services in the original building and Fryars Villa, the former Isolation hospital. 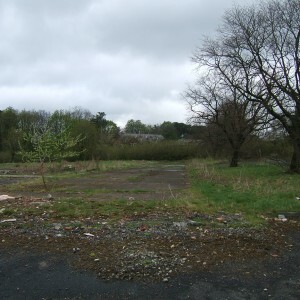 Much of the west of the site became derelict and St. Margaret’s and St. John’s Divisions were demolished. 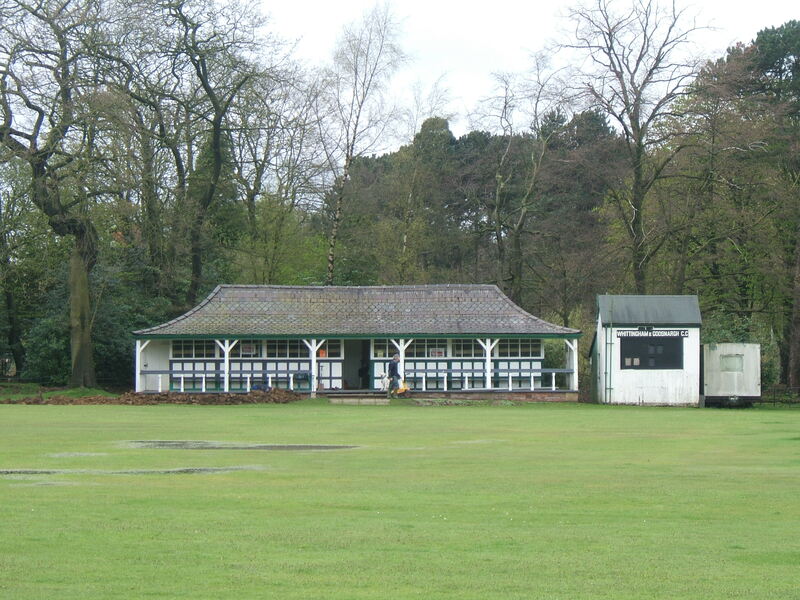 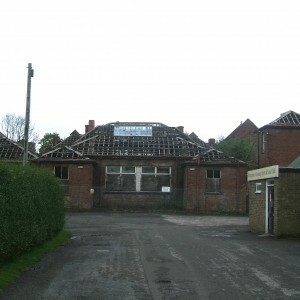 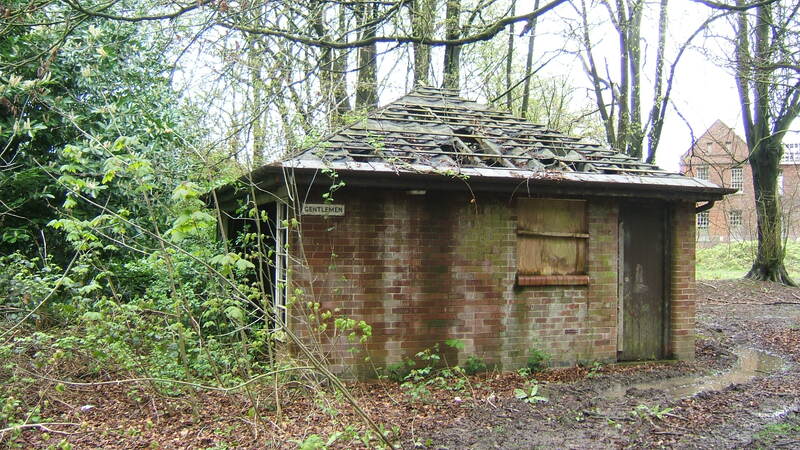 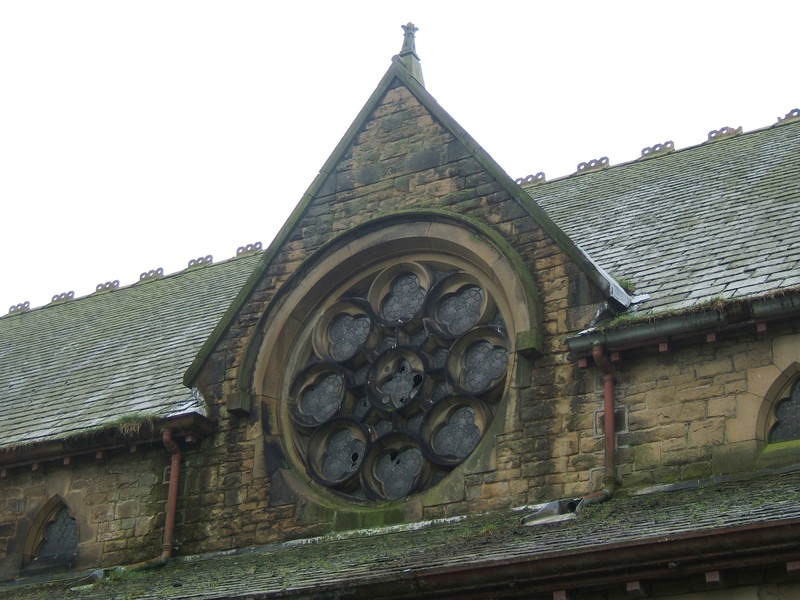 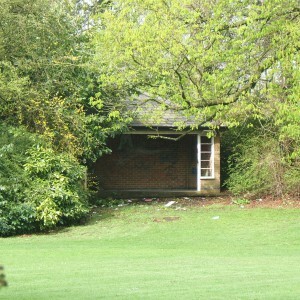 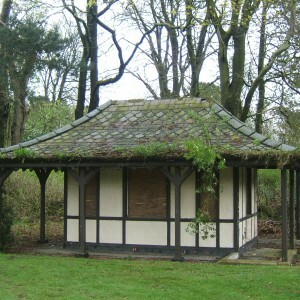 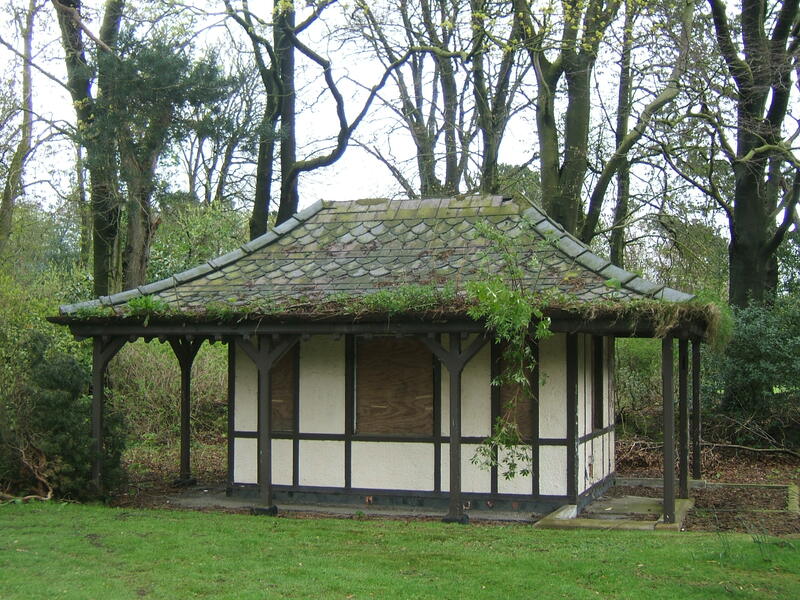 The tiles from the roof of Cameron House were removed which resulted in the rapid deterioration of the building although the adjacent sports field and staff club remained. 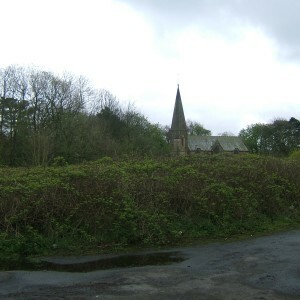 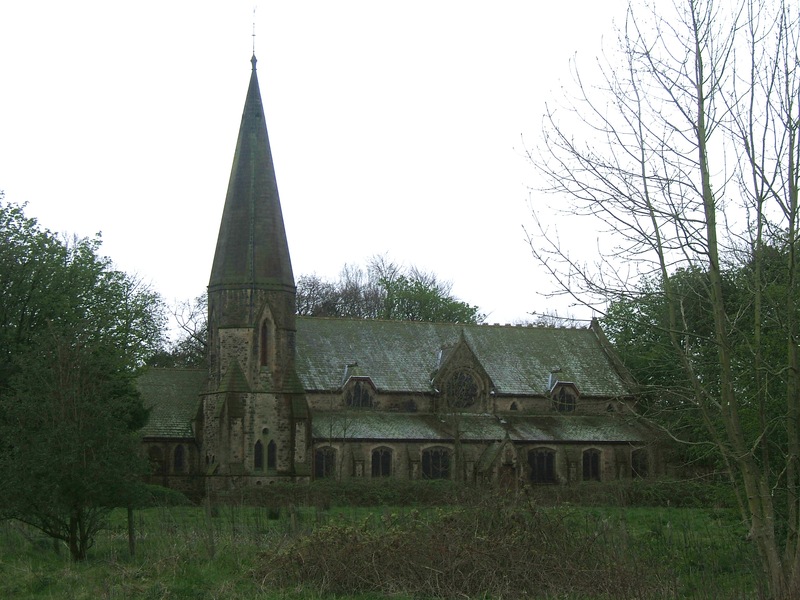 The church was mothballed and Got Field Farm demolished. 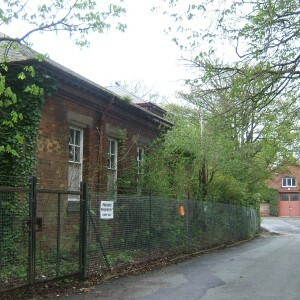 The Guild Park unit was developed on a site adjacent to the site of St. John’s Division and marked the end of remaining services on the site, with St. Luke’s division, the last in use being closed in 1995. 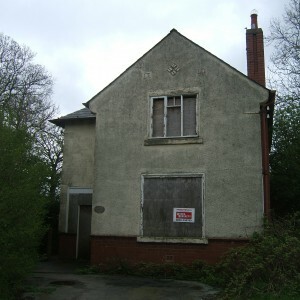 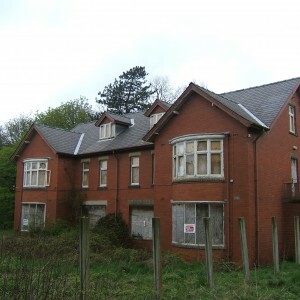 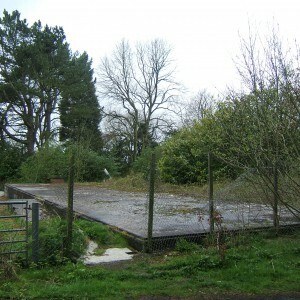 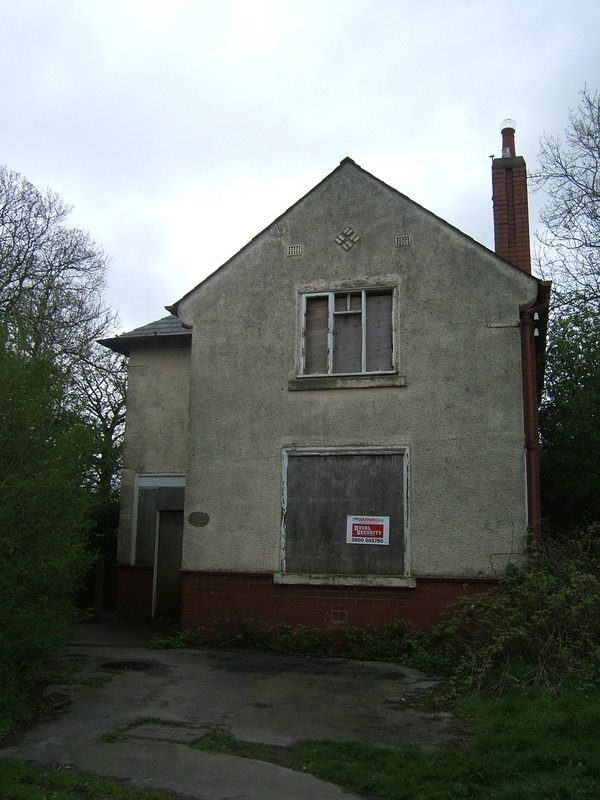 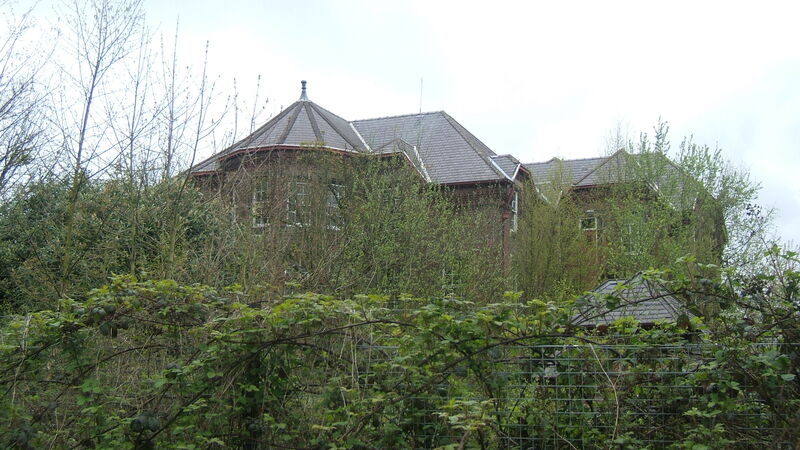 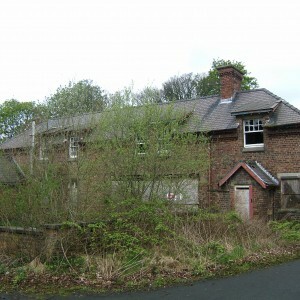 The adjacent Frank Gardham House, formerly known as Fryars Villa remained in use however as did much of the staff housing and yard around the station site, although the station itself had been largely demolished after closure. 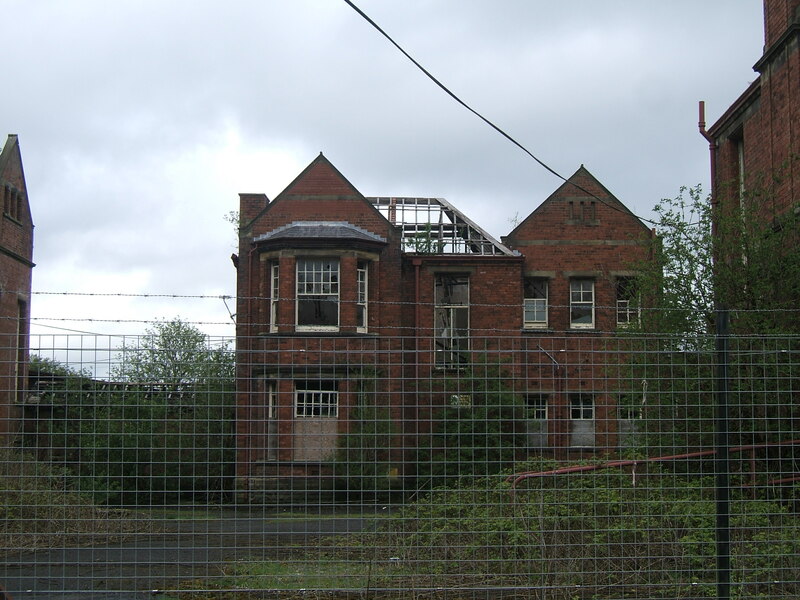 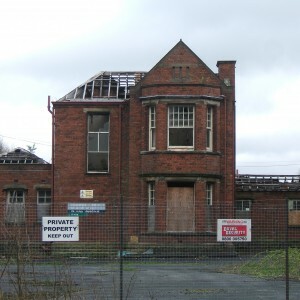 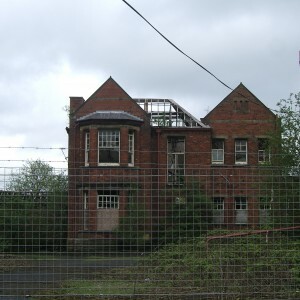 After remaining disused for almost 2 decades, the remaining sections of the site were demolished including Cameron house, St. Luke’s division, nurse’s home and most associated buildings not still in use in connection with Guild Park. 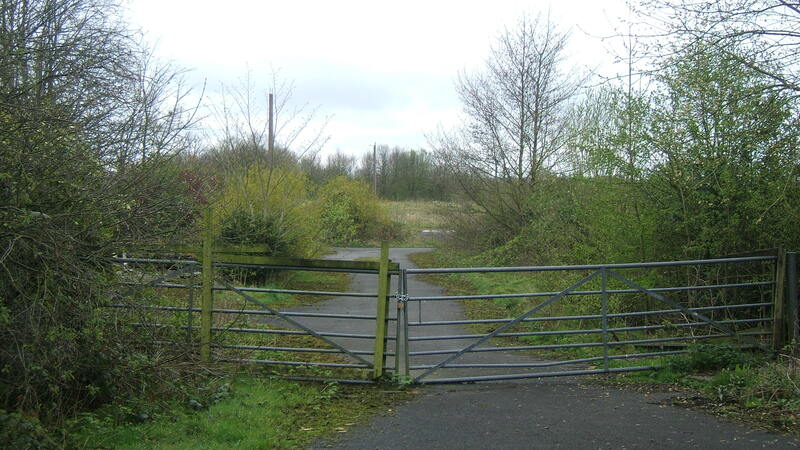 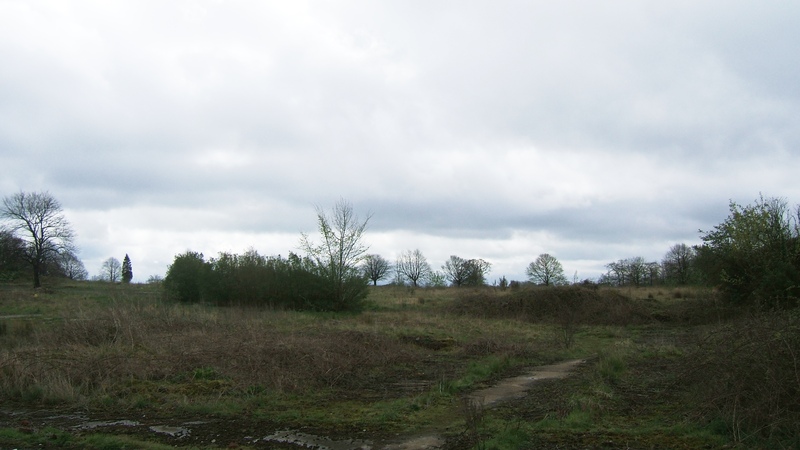 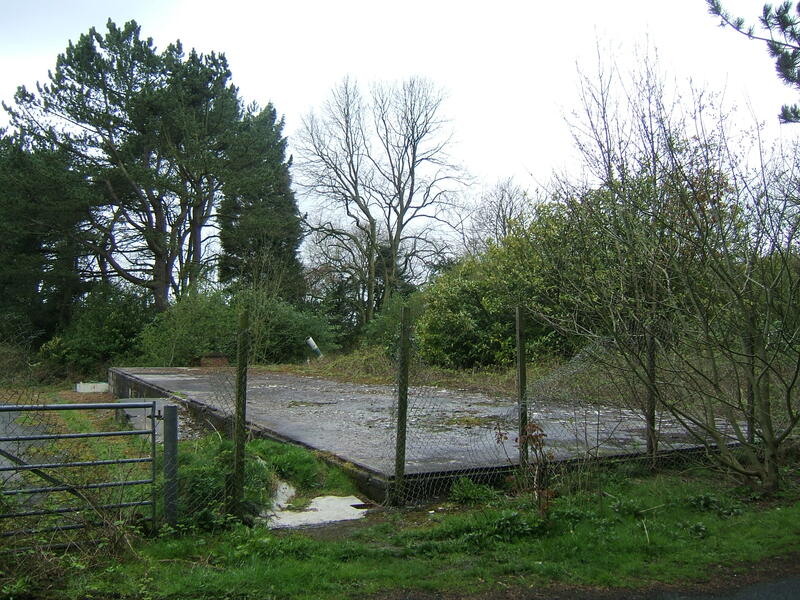 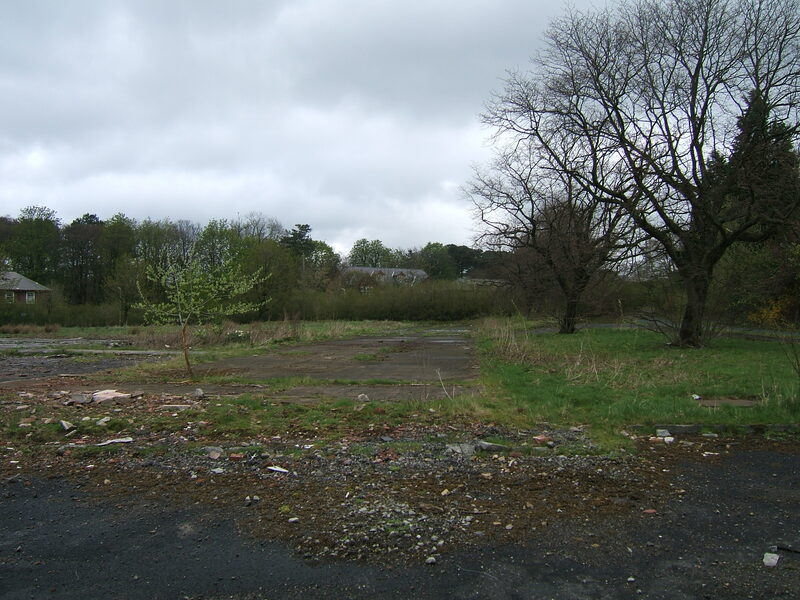 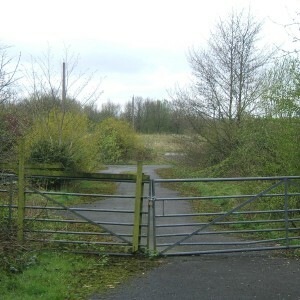 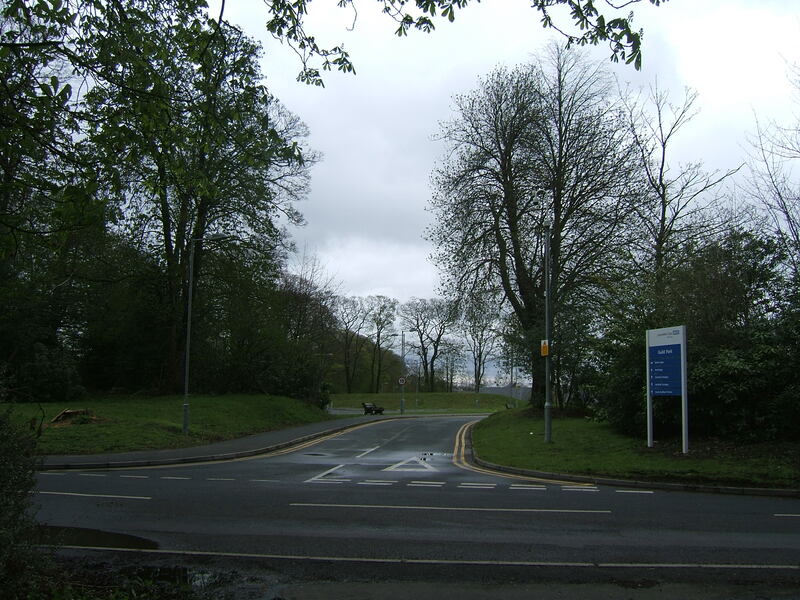 The site of the hospital is presently being redeveloped for a major housing development, which has involved the creation of a new access road between the former drives. 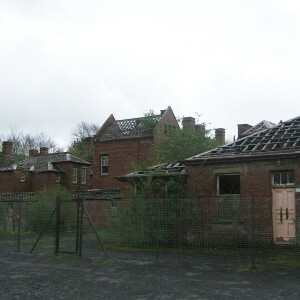 The hospital cemetery, church, and admin block have survived and remain amongst the modern developments. 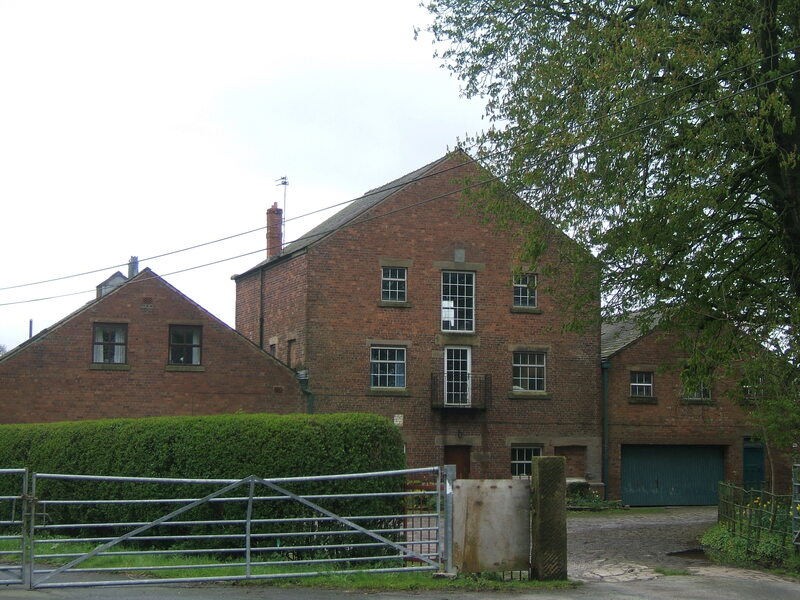 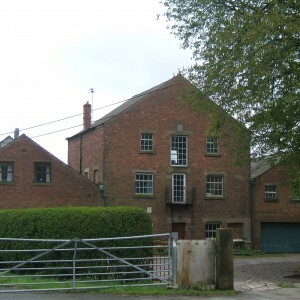 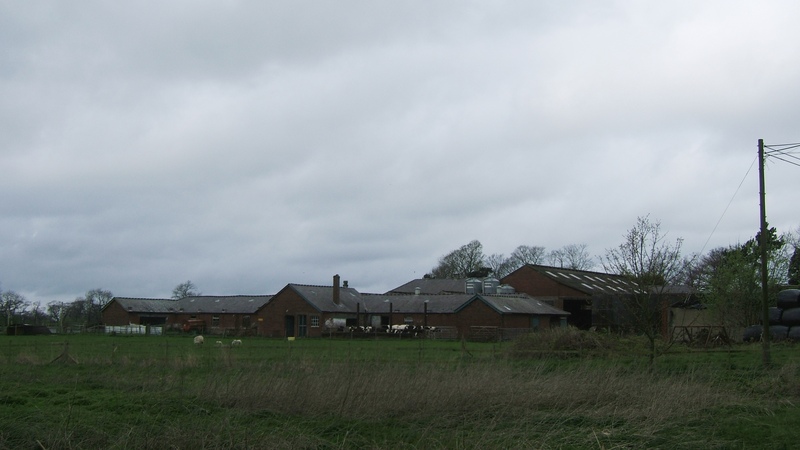 Haighton Hall Farm and Whittingham Hall Farm complexes both survive in private ownership adjacent to the site. 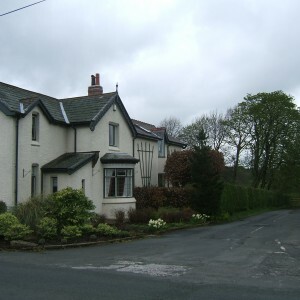 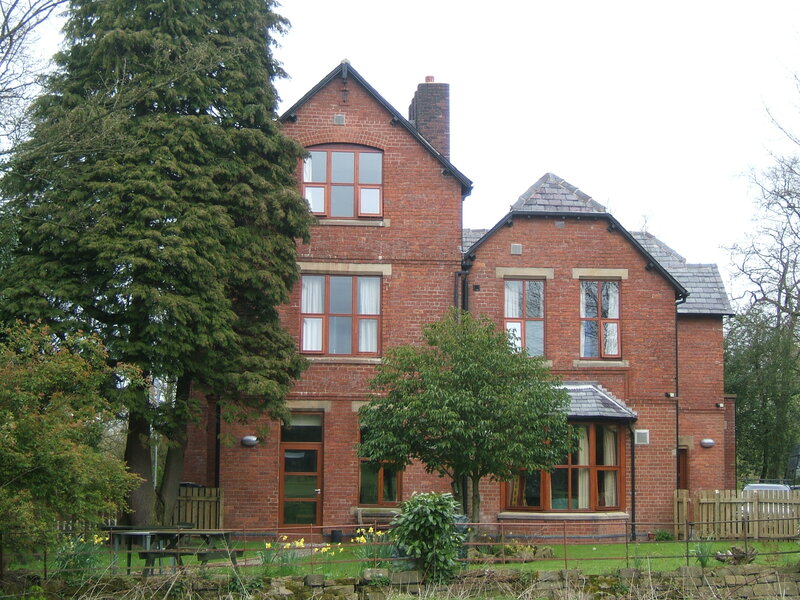 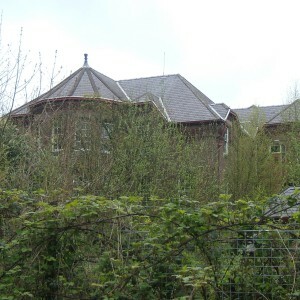 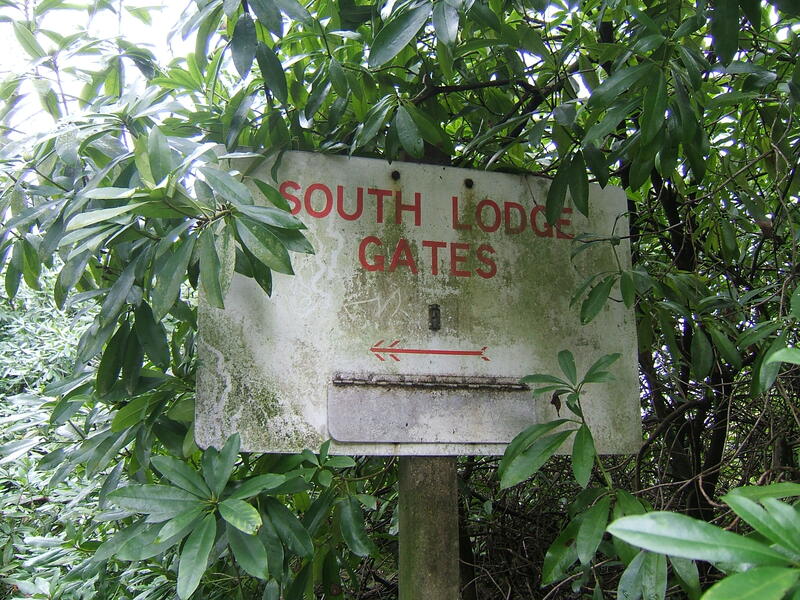 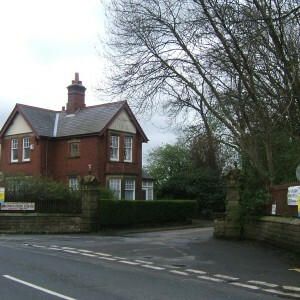 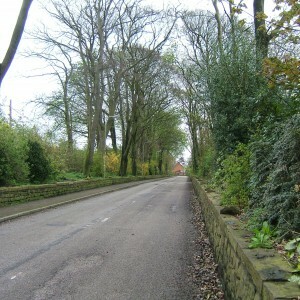 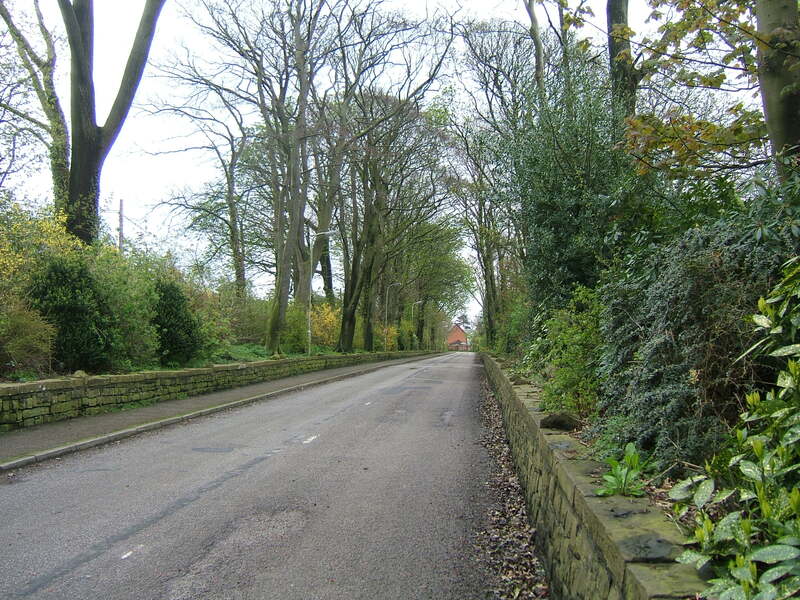 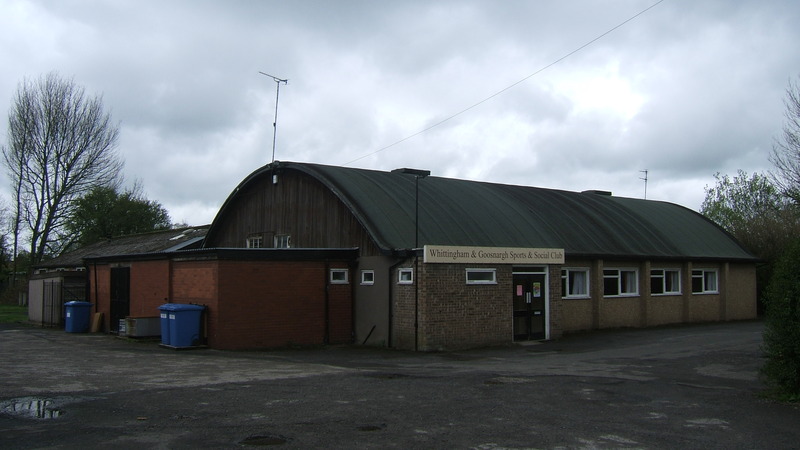 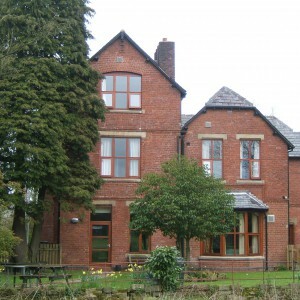 Former staff housing on Whittingham Lane in Goosnargh and Cumeragh villages remain in private occupation as do New and South Lodges, whilst main lodge survives in connection with Guild Park mental health unit.